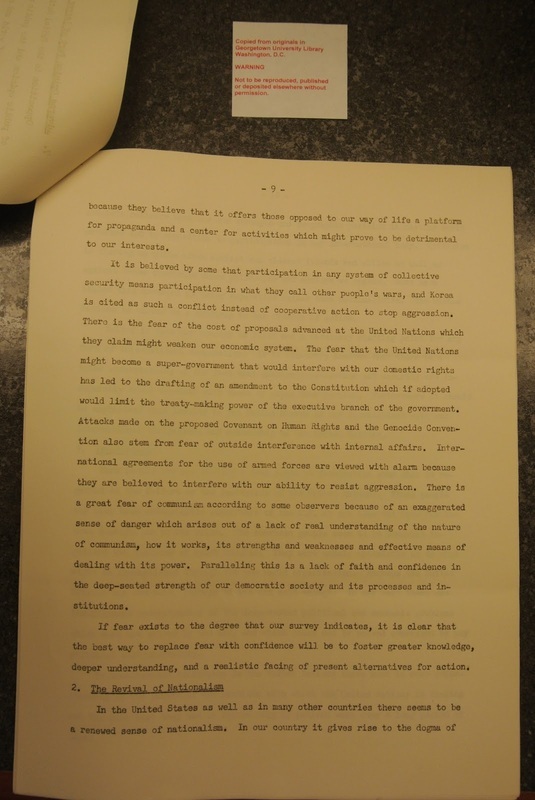 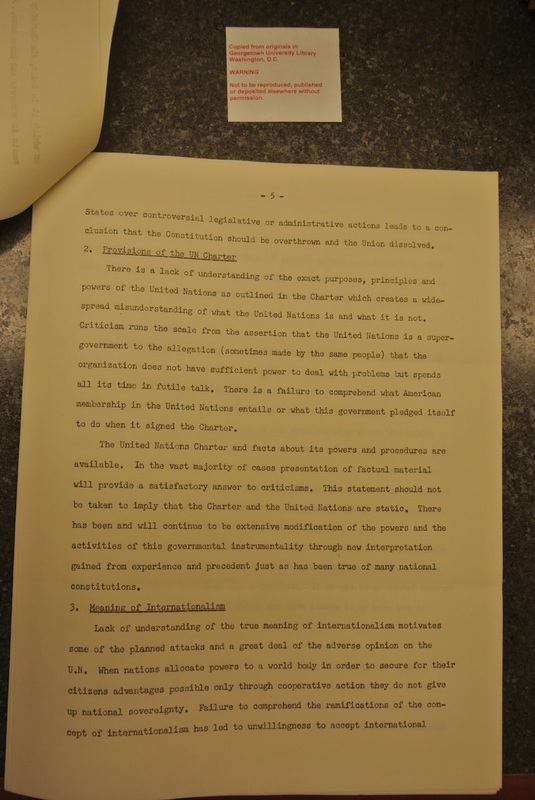 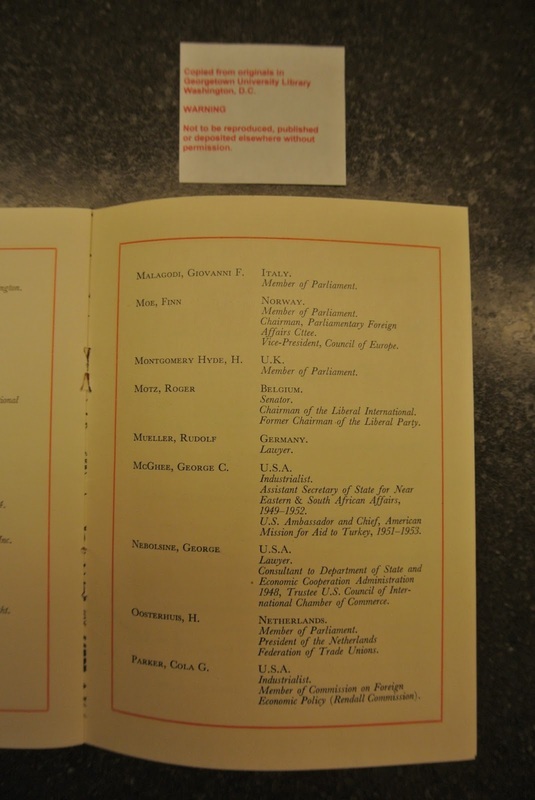 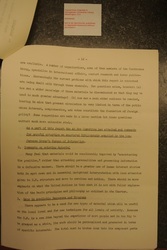 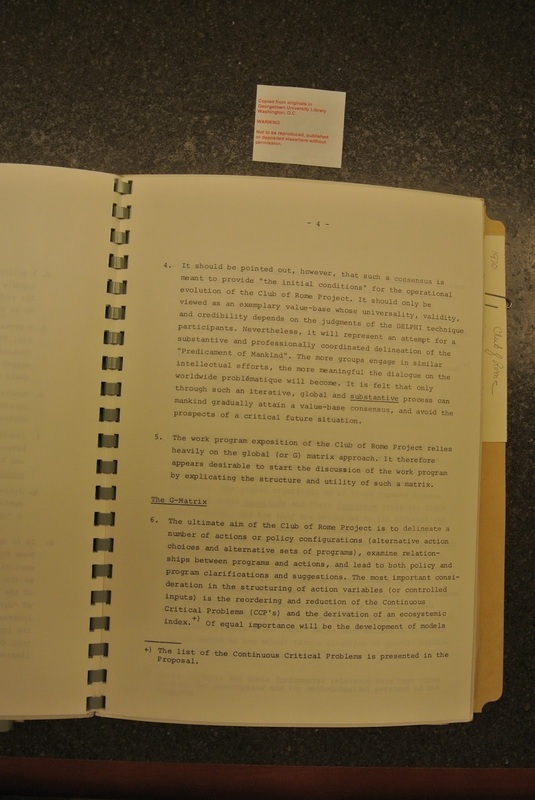 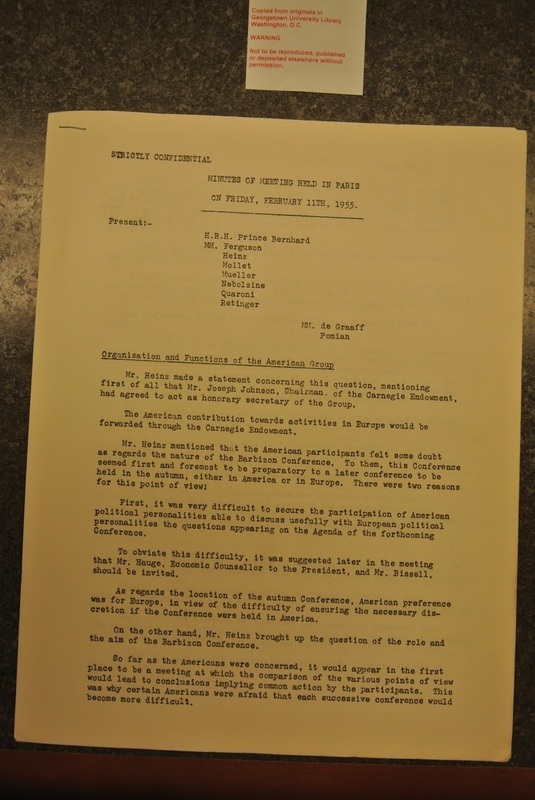 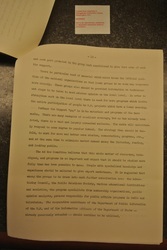 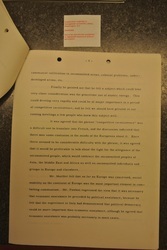 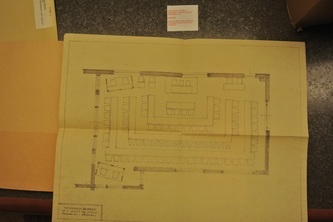 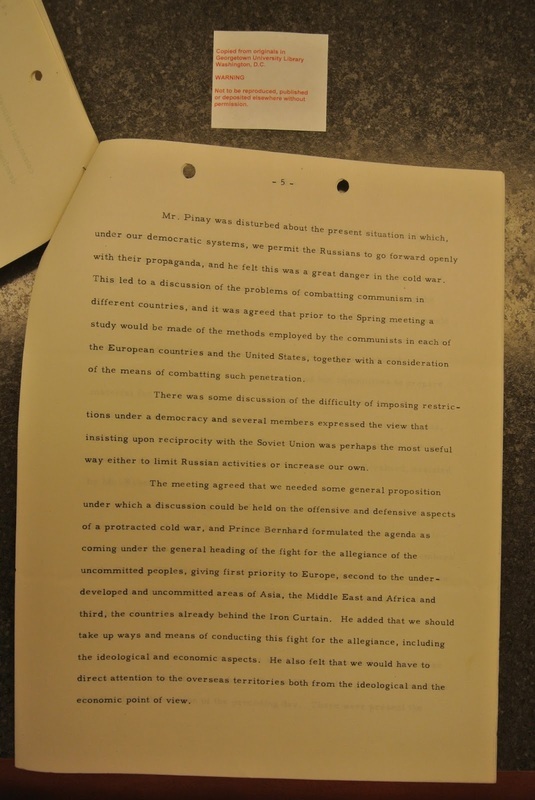 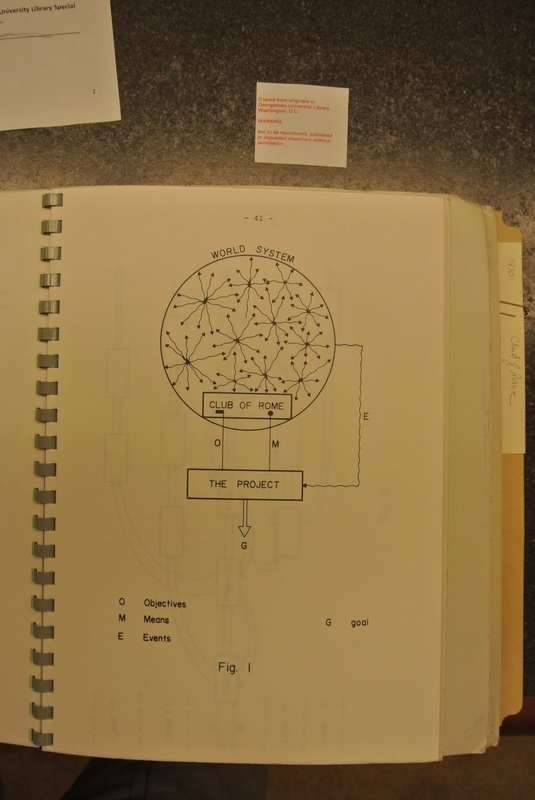 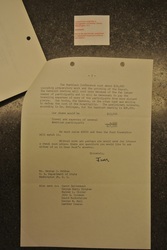 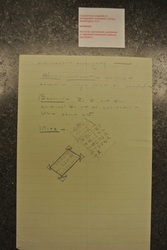 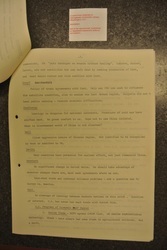 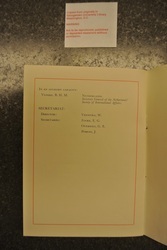 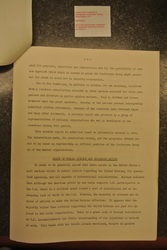 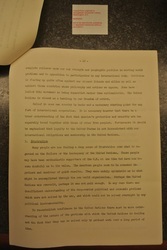 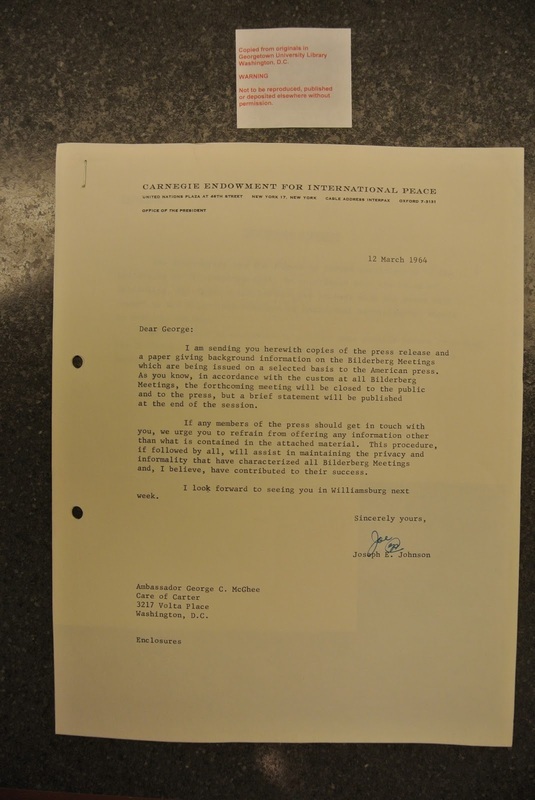 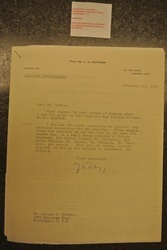 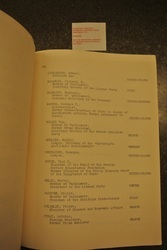 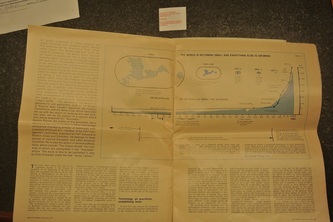 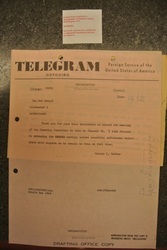 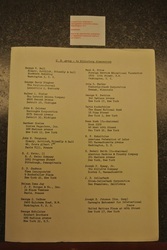 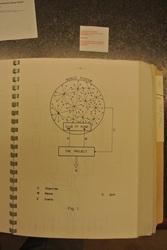 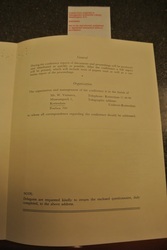 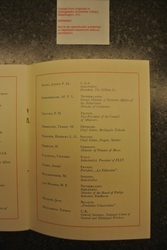 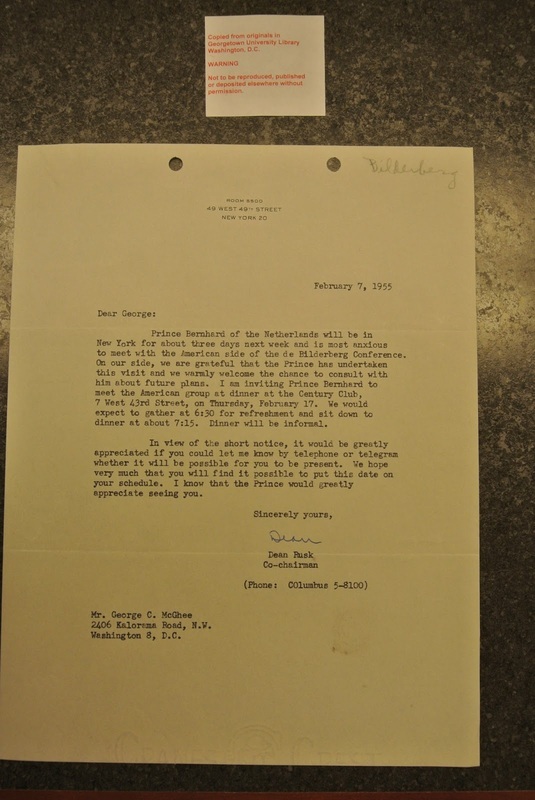 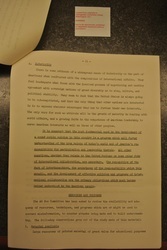 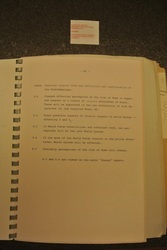 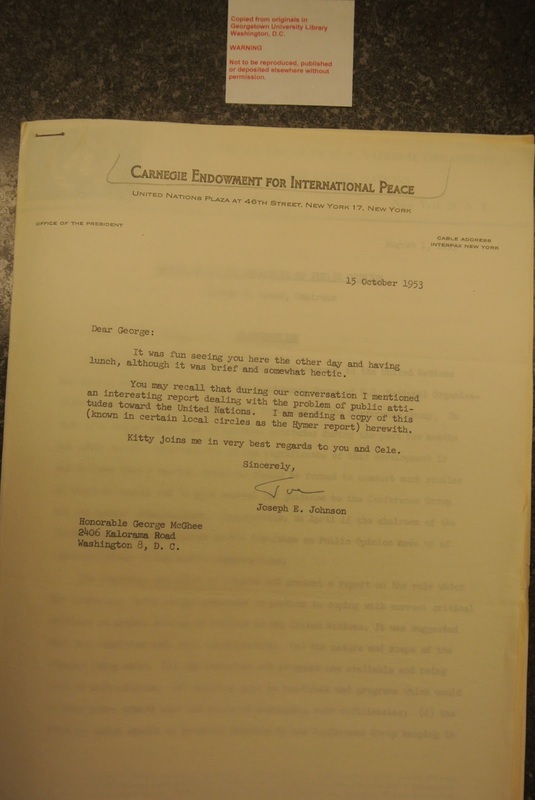 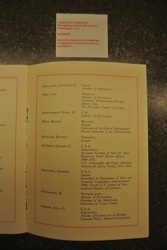 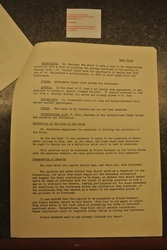 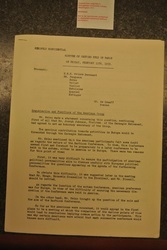 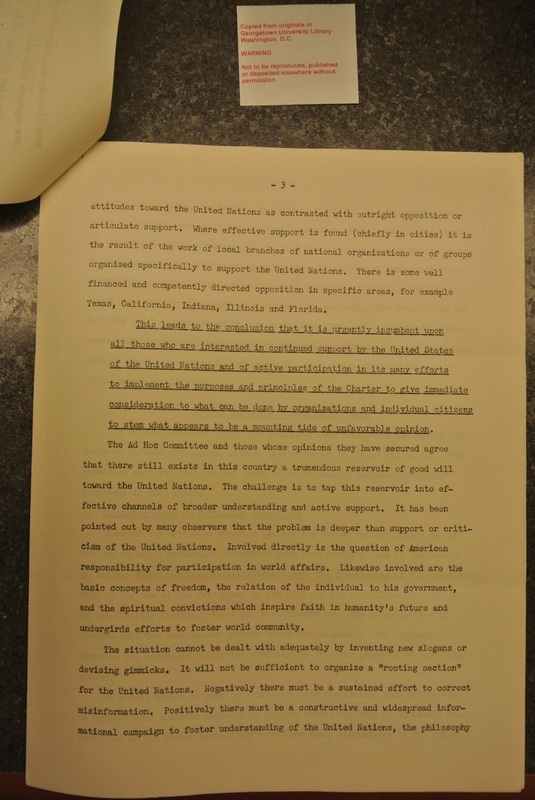 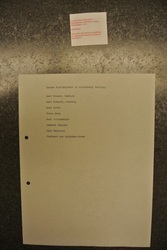 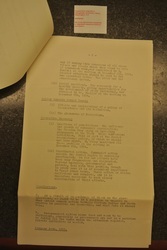 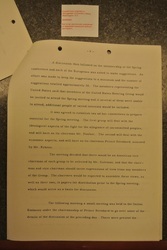 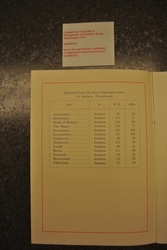 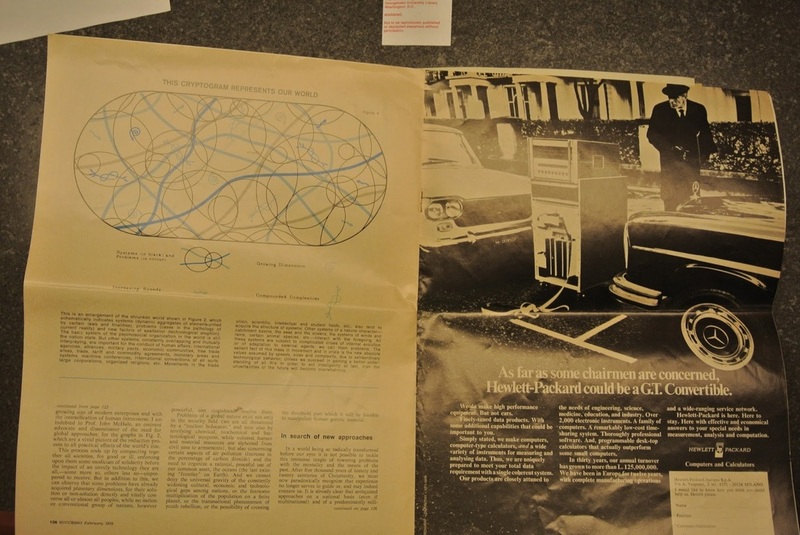 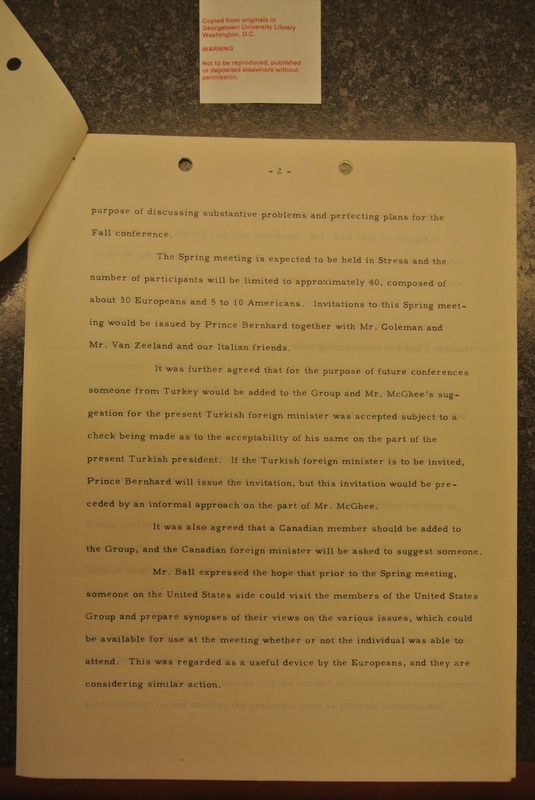 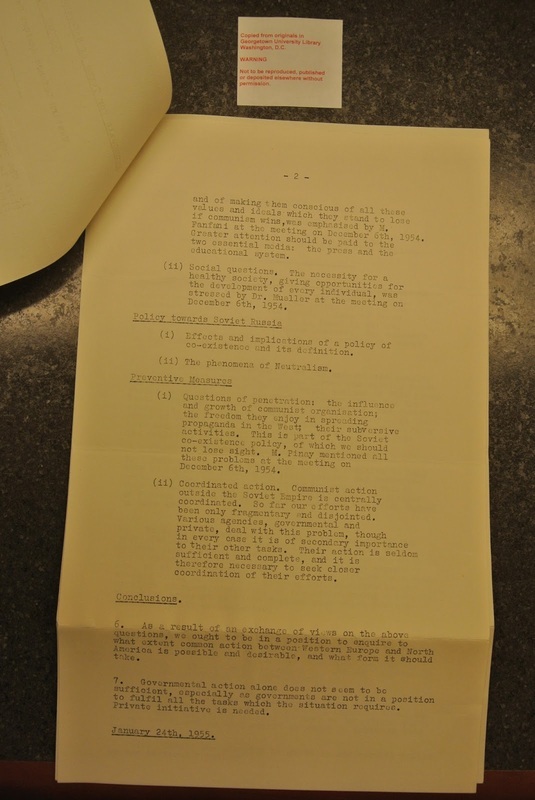 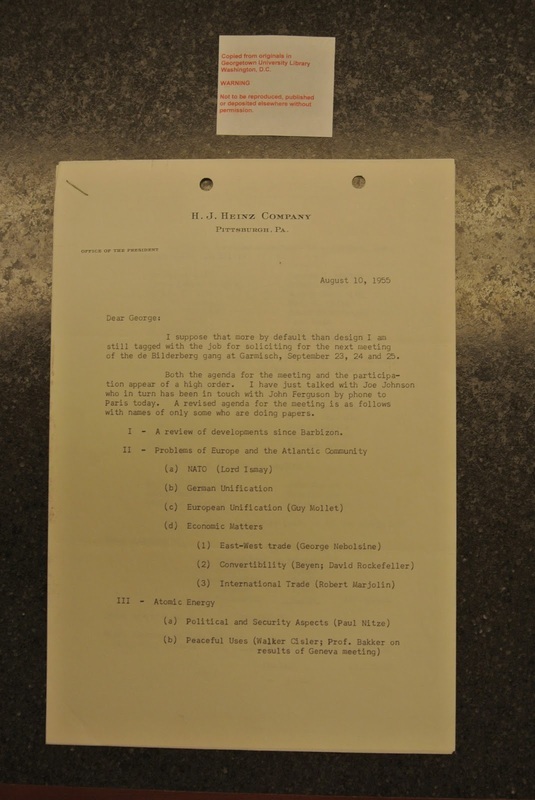 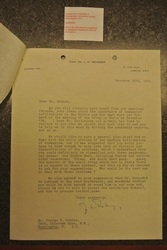 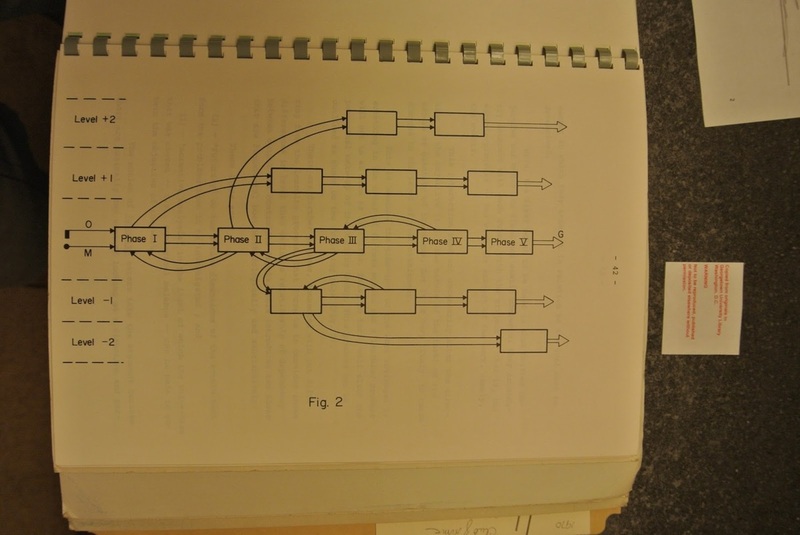 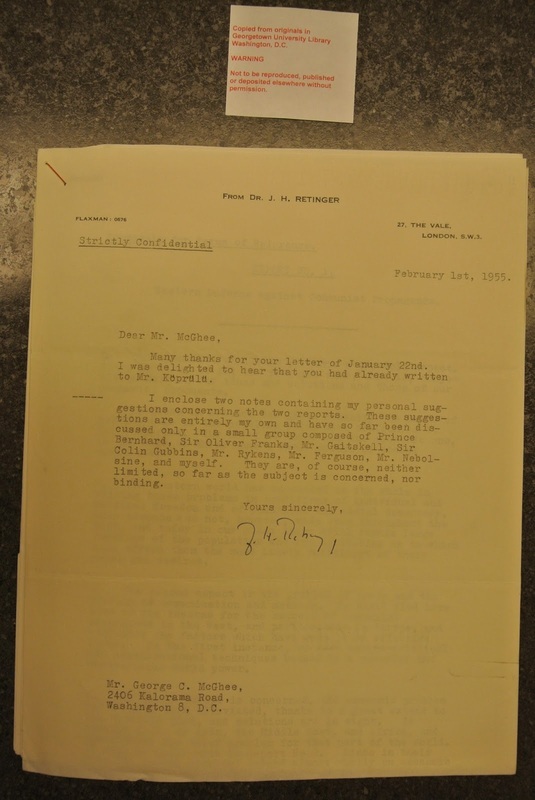 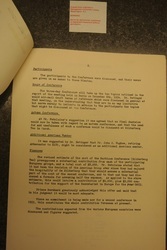 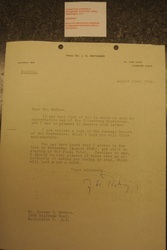 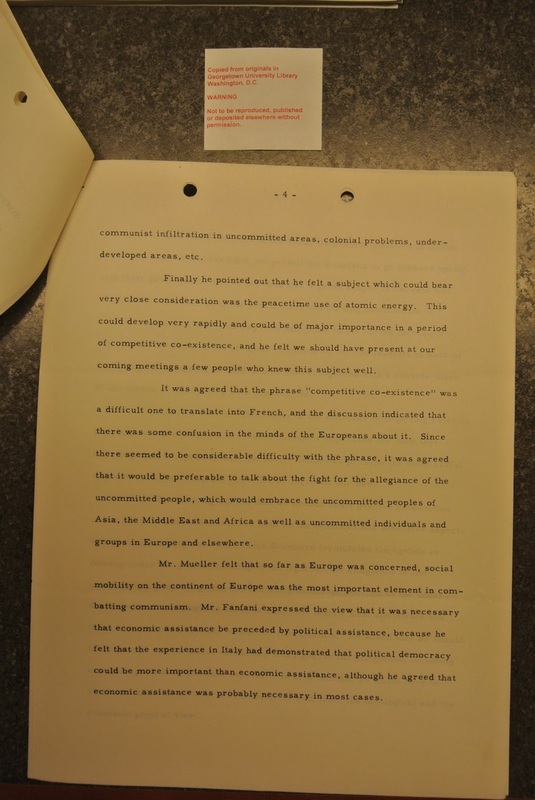 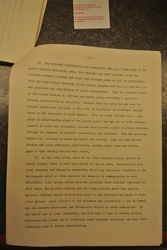 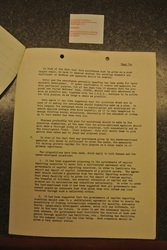 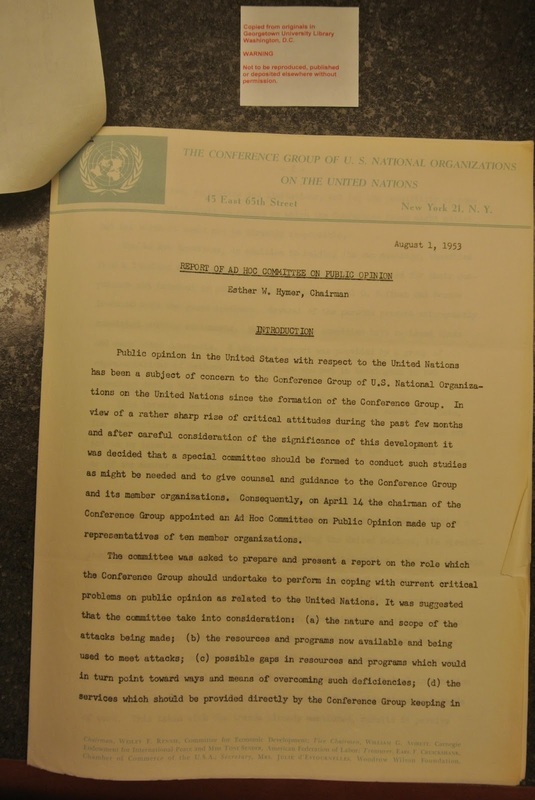 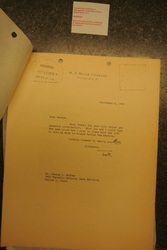 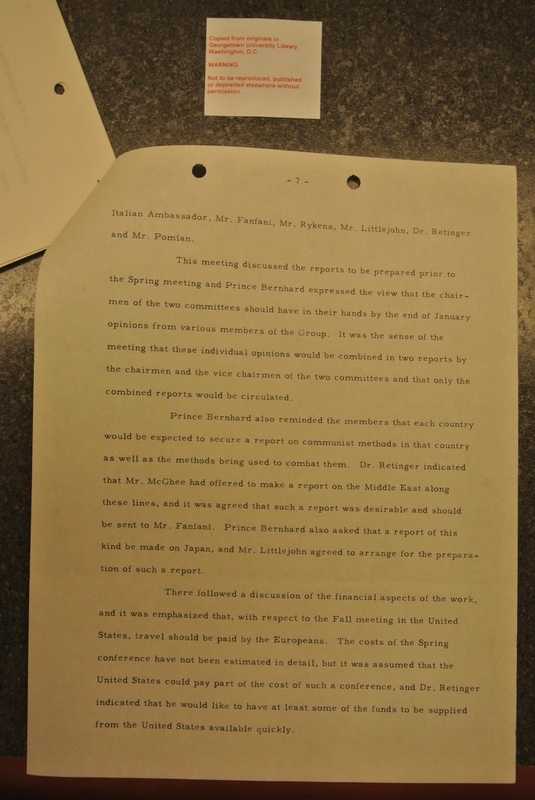 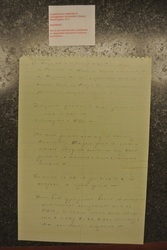 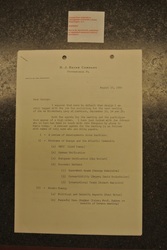 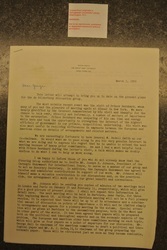 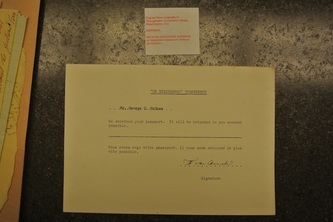 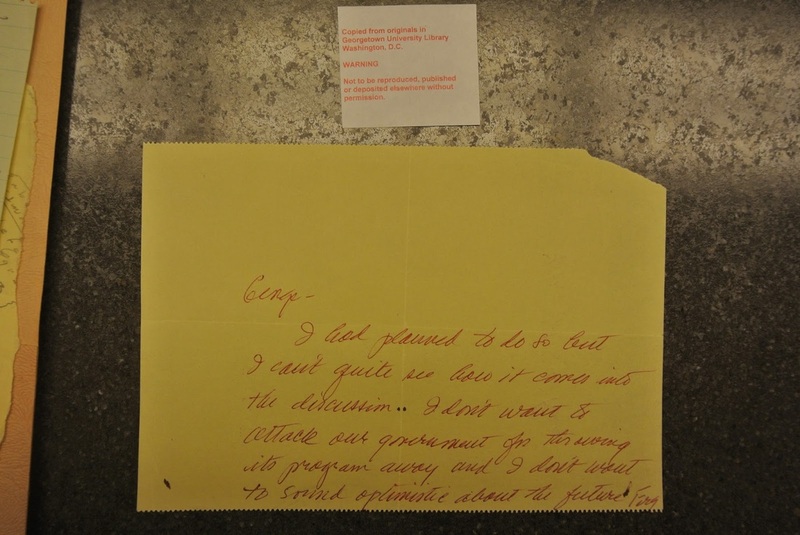 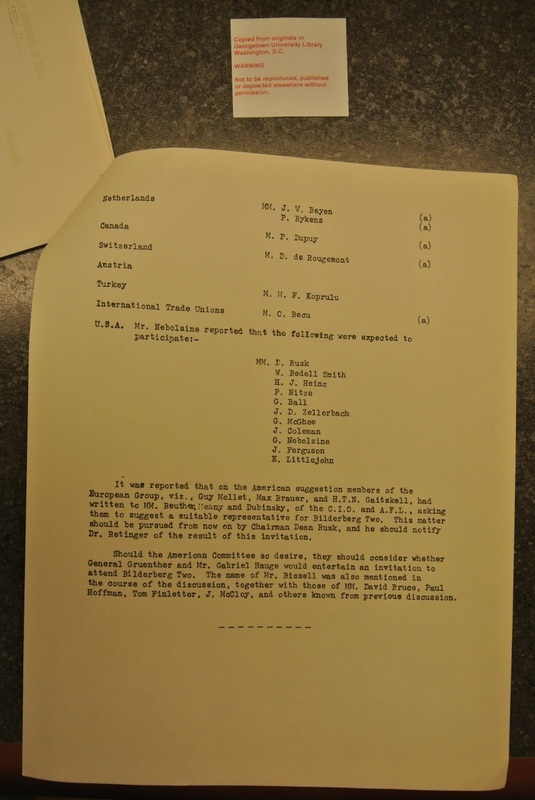 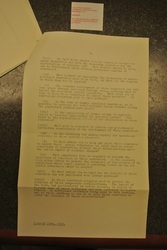 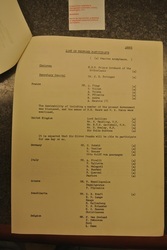 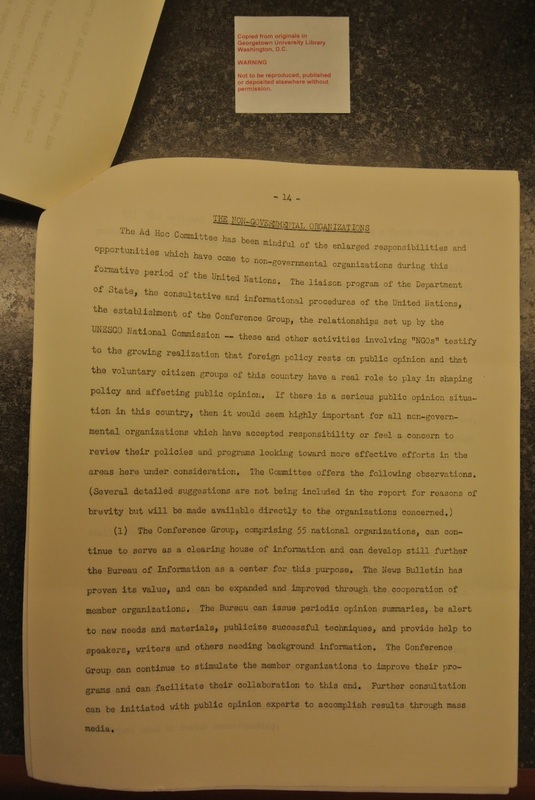 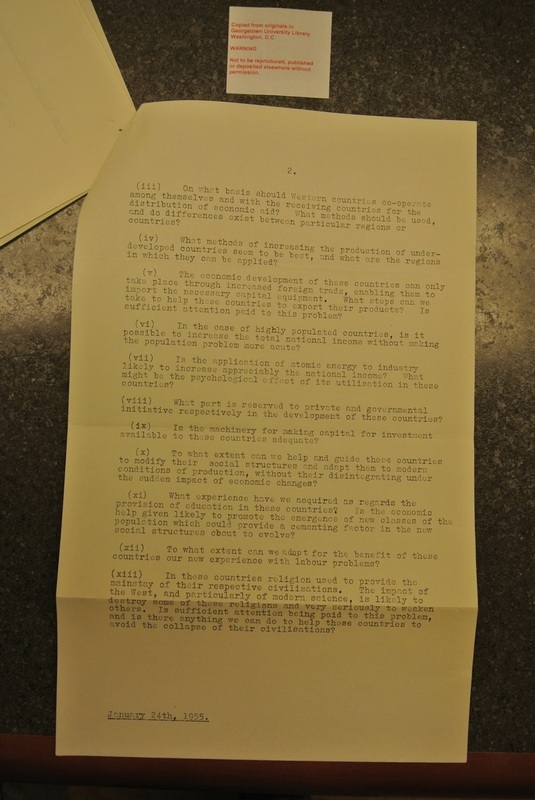 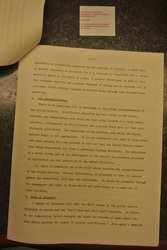 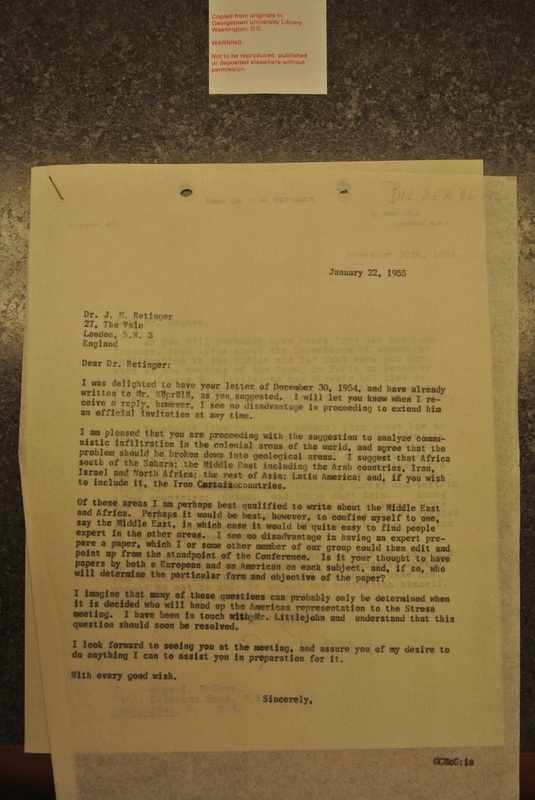 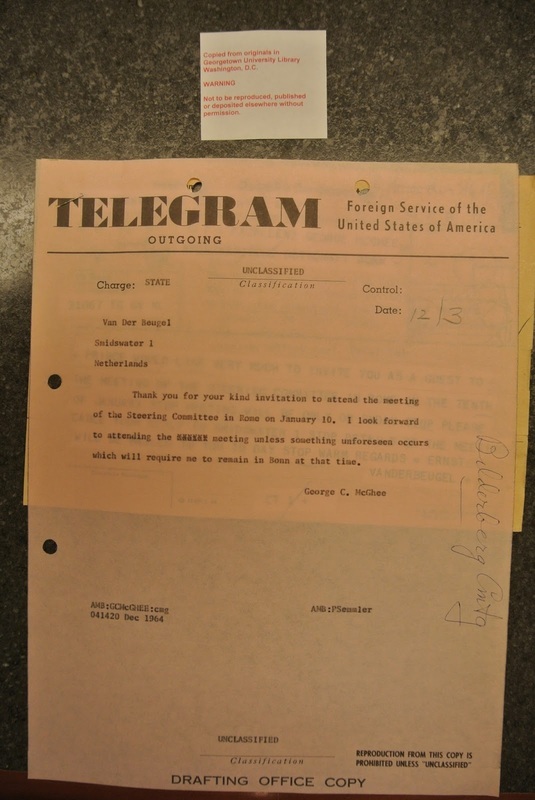 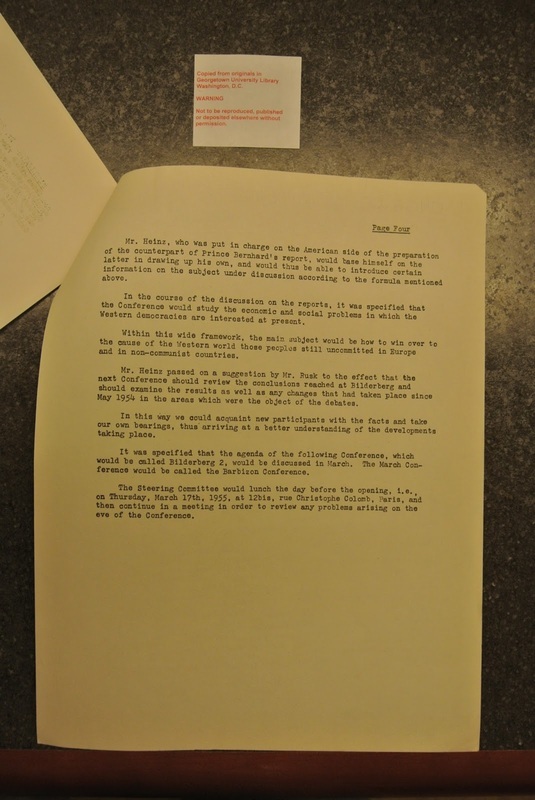 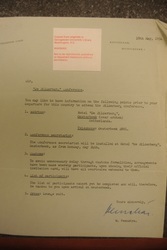 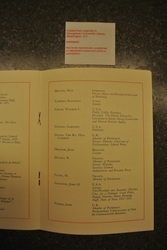 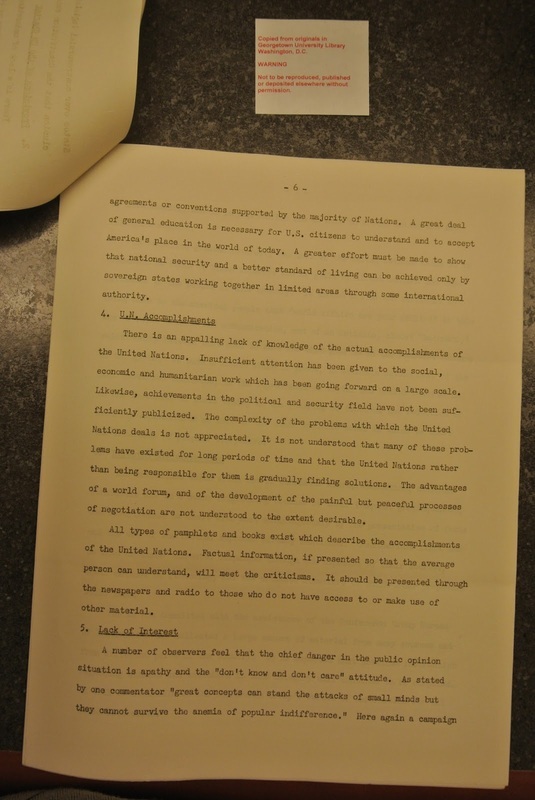 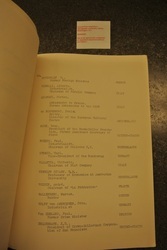 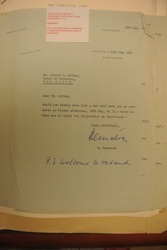 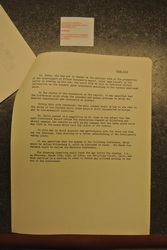 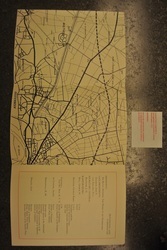 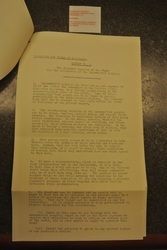 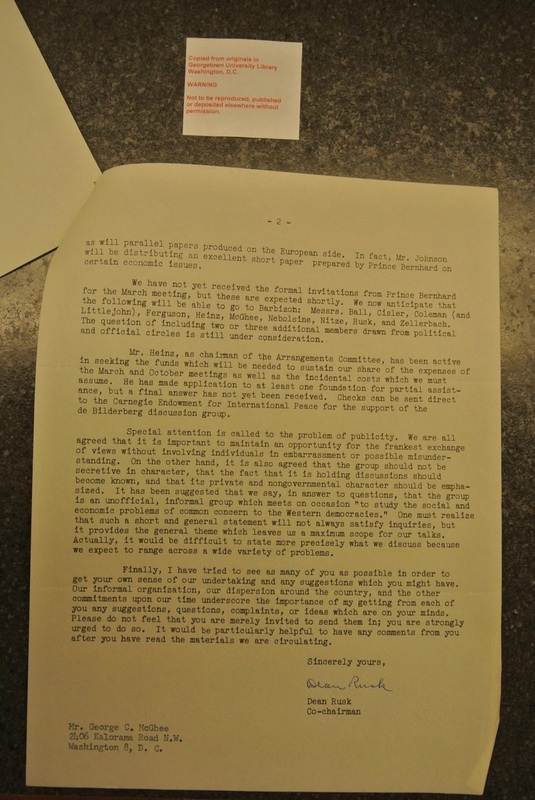 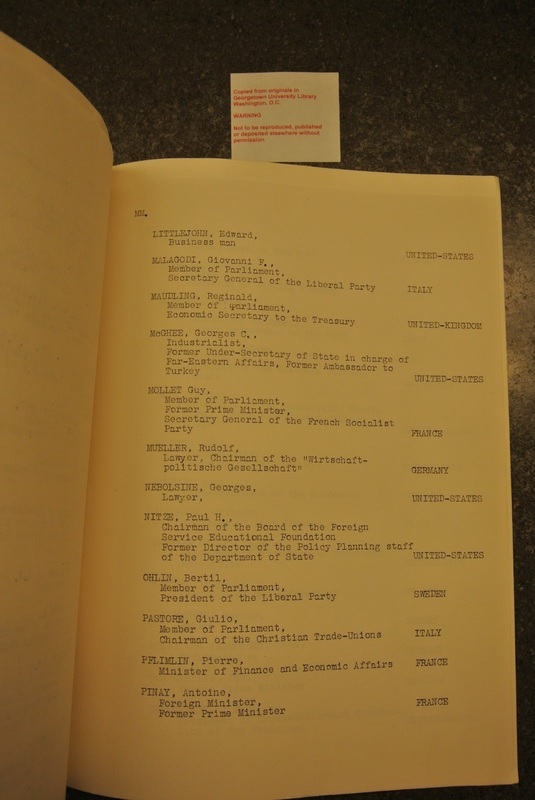 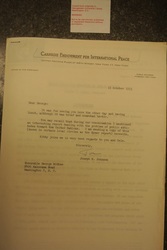 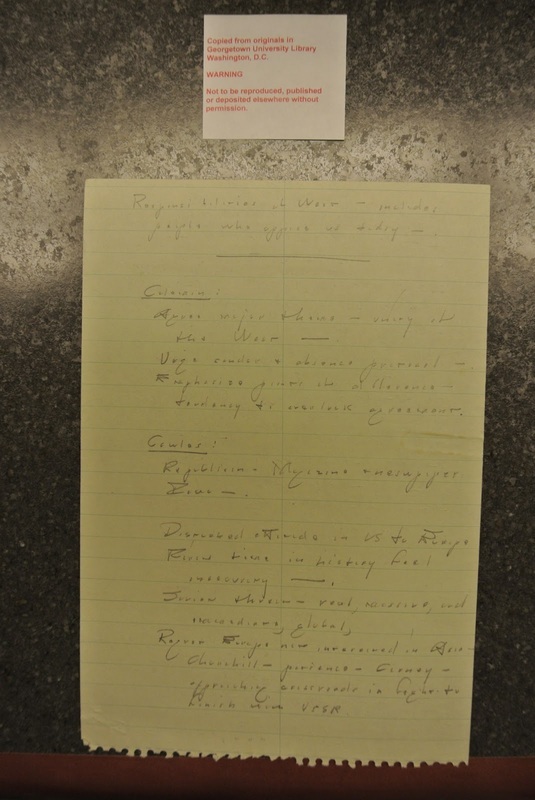 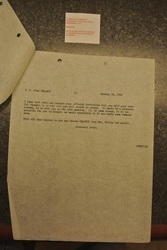 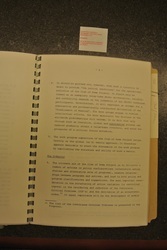 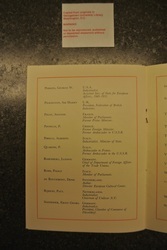 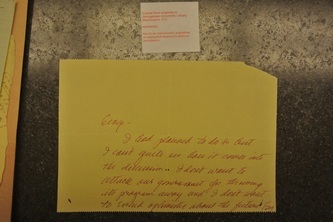 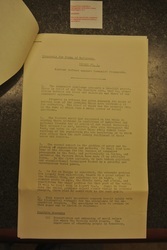 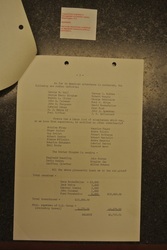 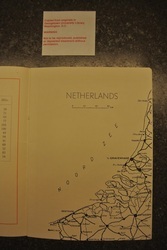 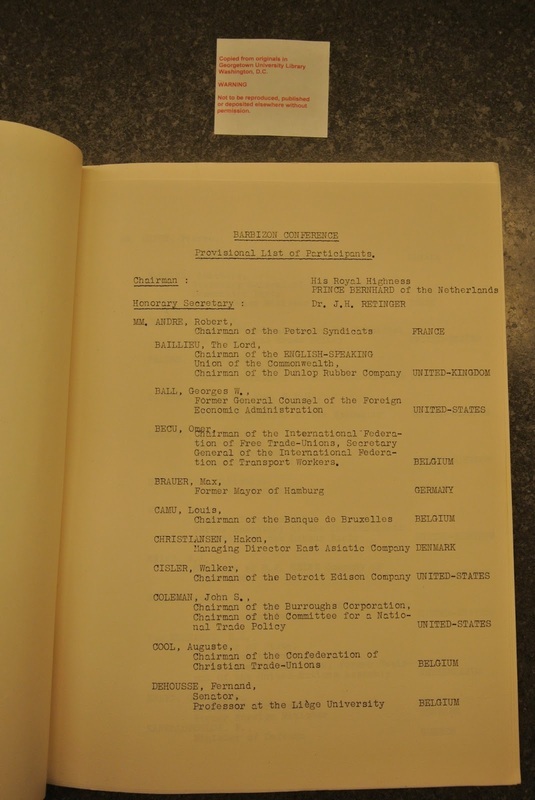 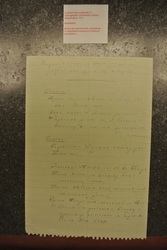 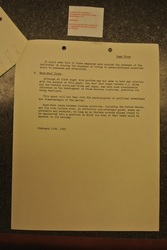 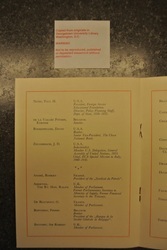 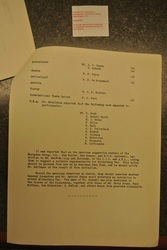 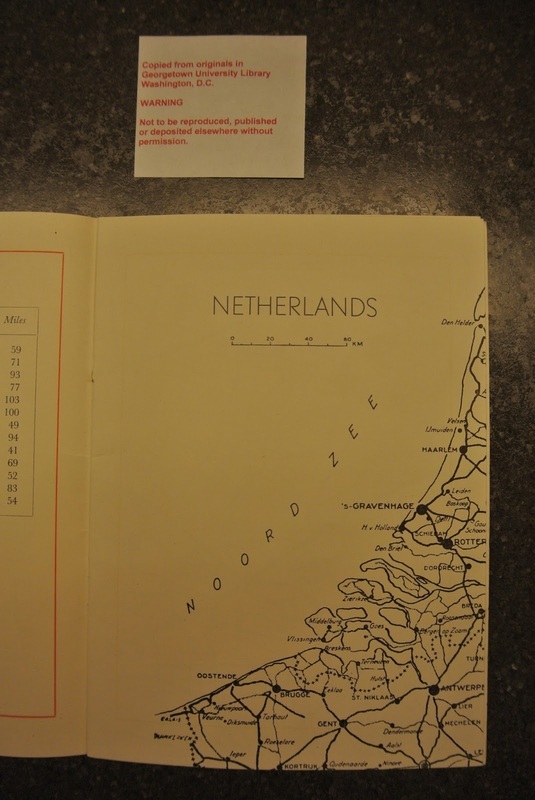 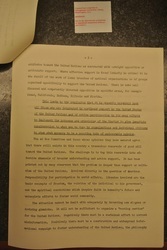 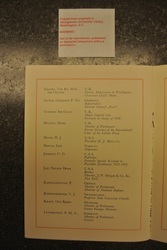 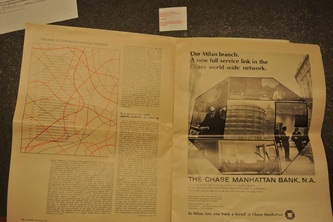 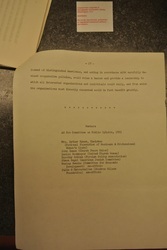 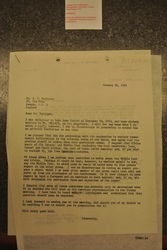 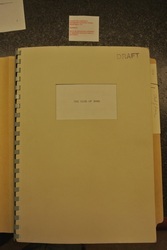 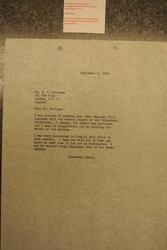 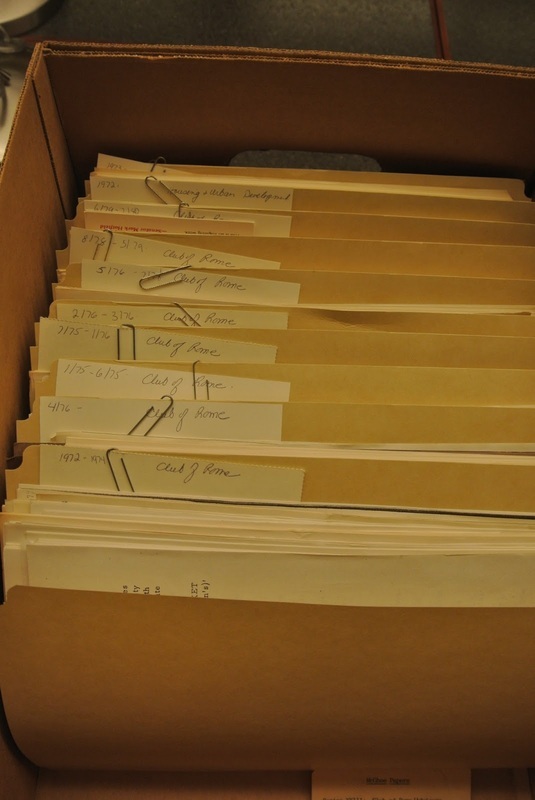 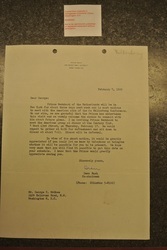 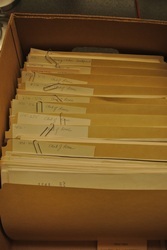 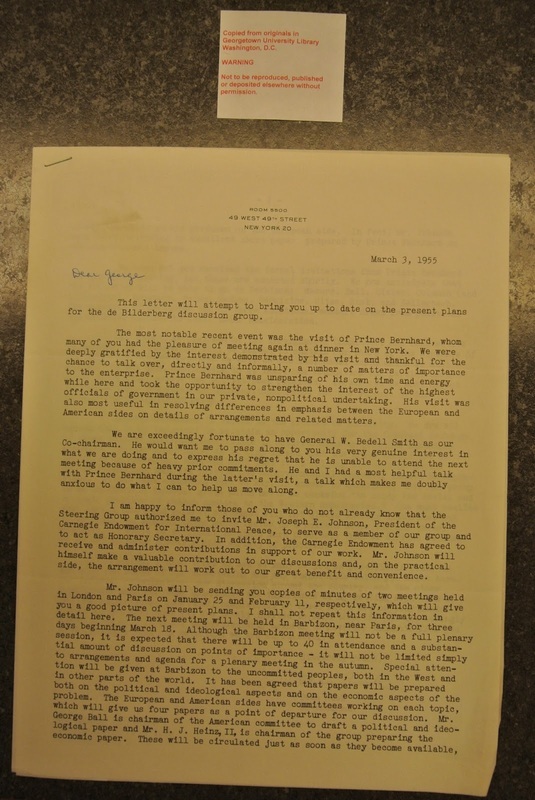 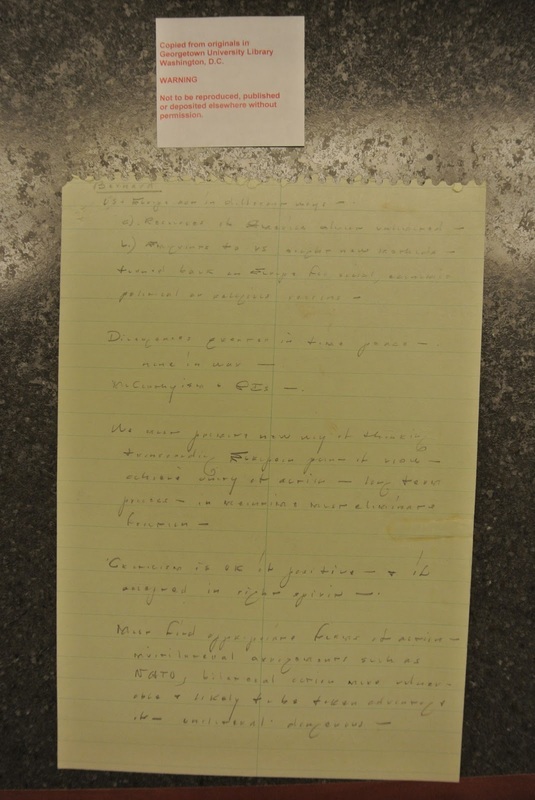 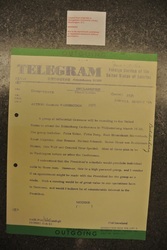 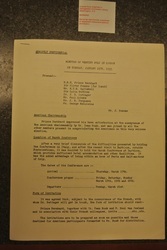 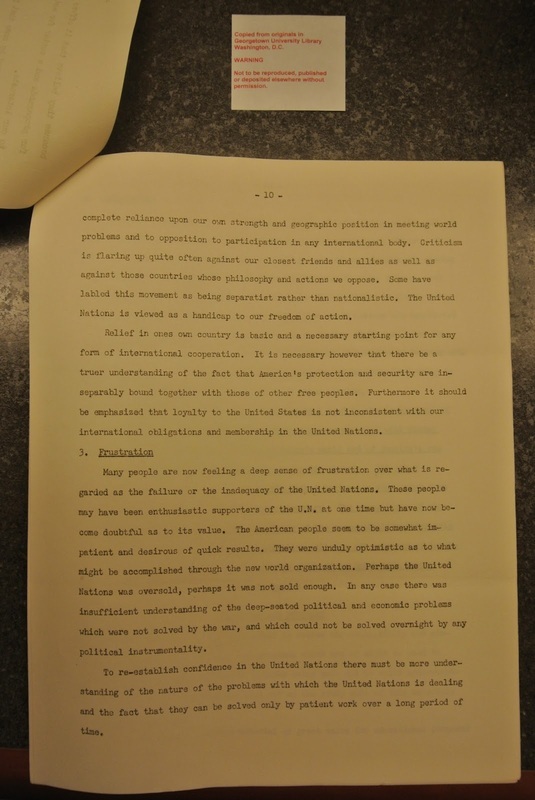 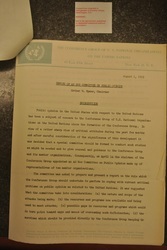 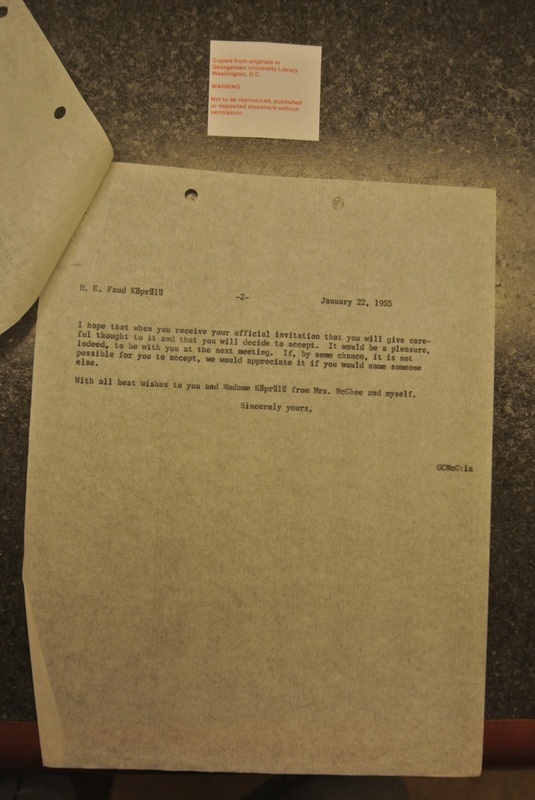 Papers of the former U.S. ambassador to Turkey (1951-1953) and West Germany (1963-1968) include files relating to both ambassadorships, as well as materials documenting McGhee’s role in a number of important official and informal posts, among which are the Combined Raw Materials Board (during World War II), the Bilderberg Group, the Draper Committee, the Business Council for International Development, and the Committee for Economic Development. 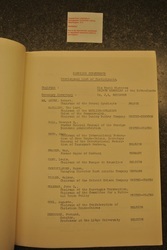 Ambassador McGhee’s substantial library of books on Turkey and the Ottoman Empire is described separately under European History. 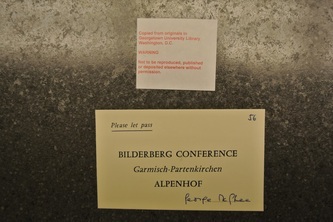 Below are over 100 photographs taken on June 17, 2013. 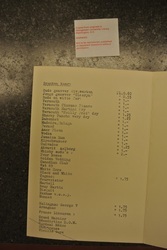 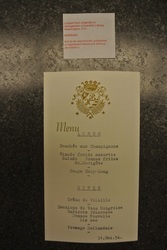 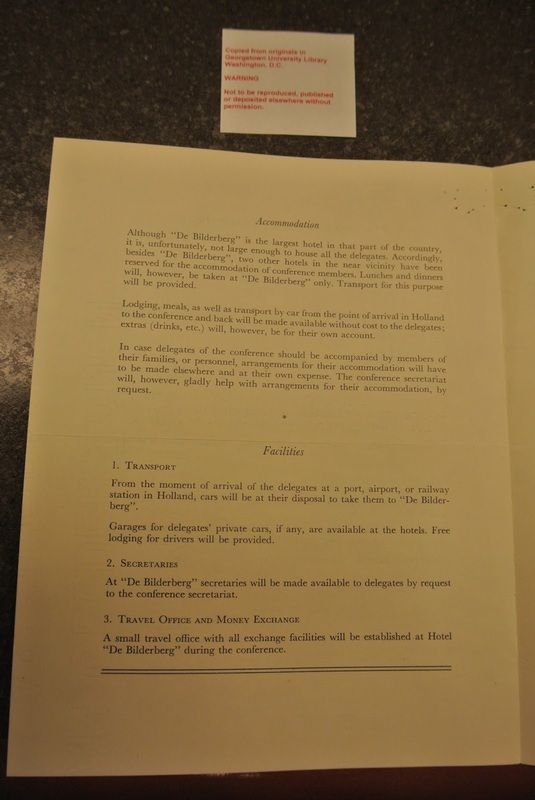 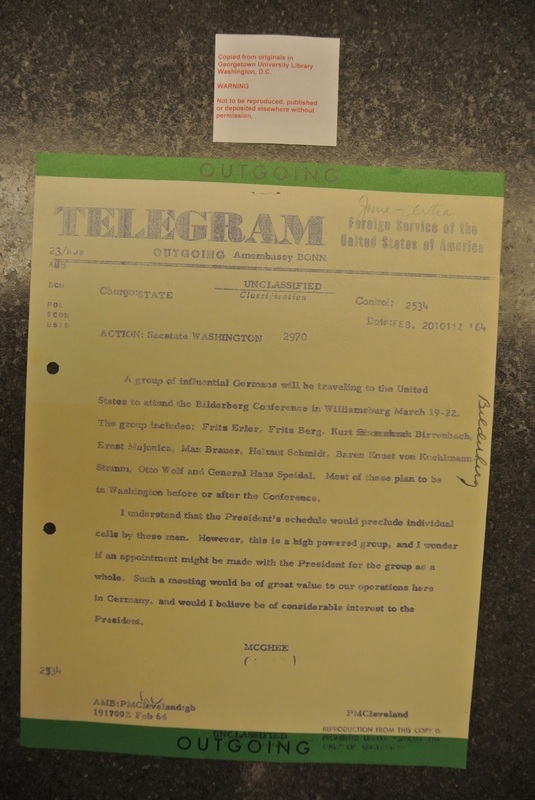 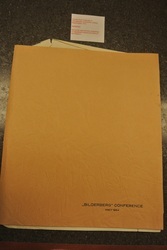 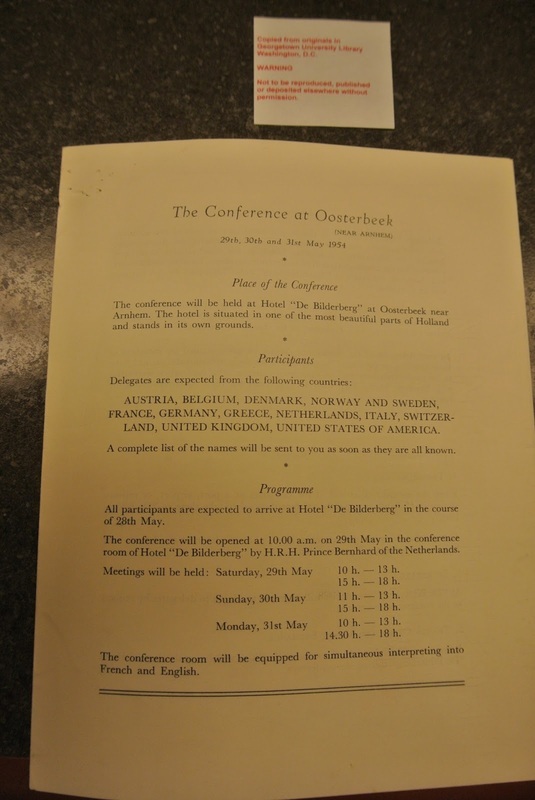 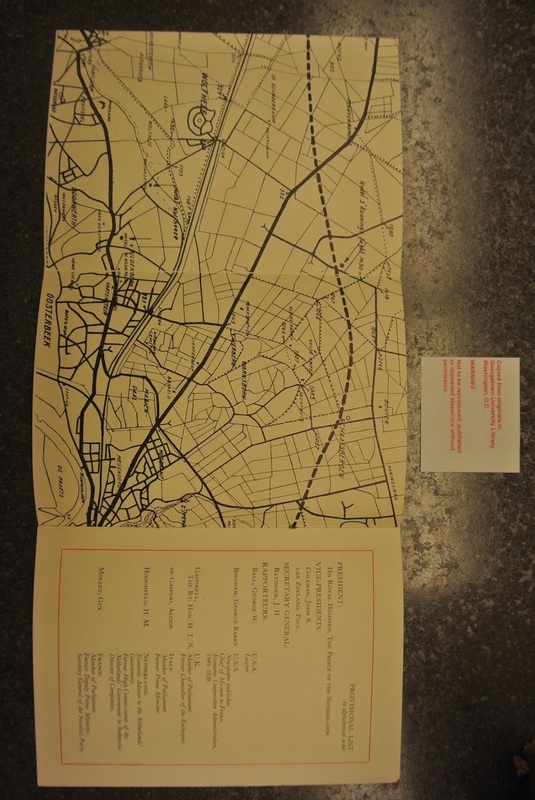 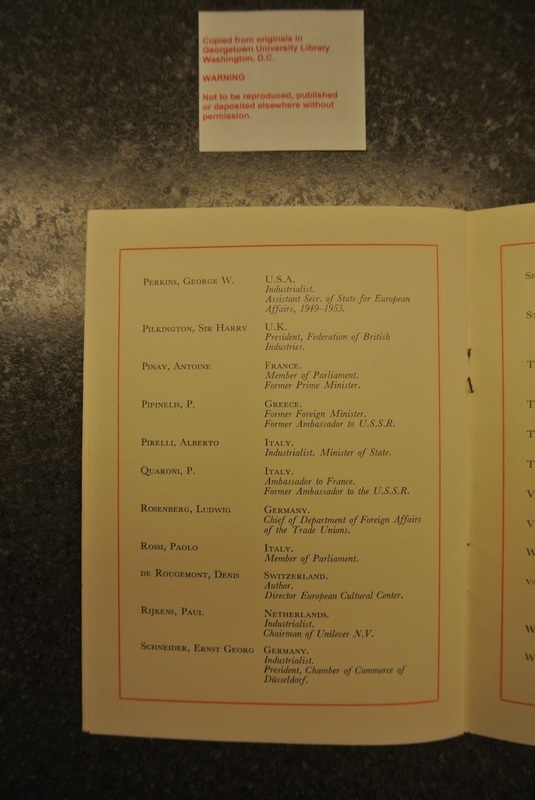 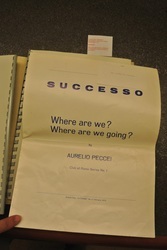 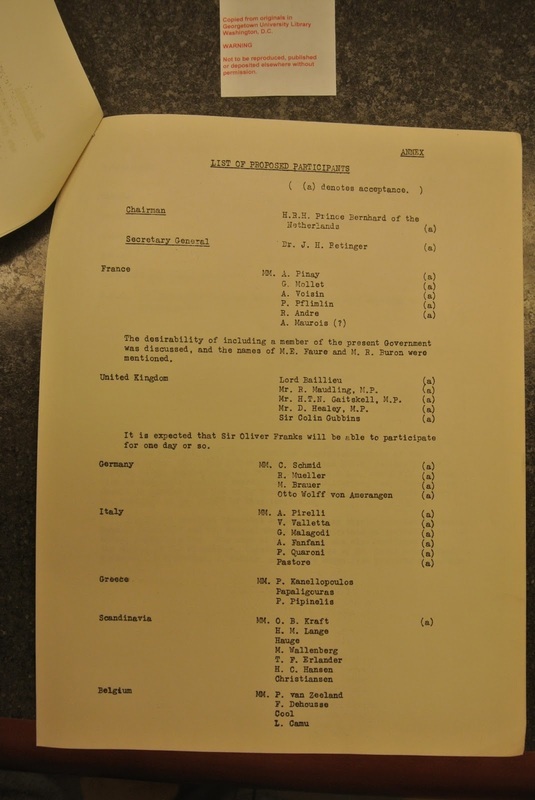 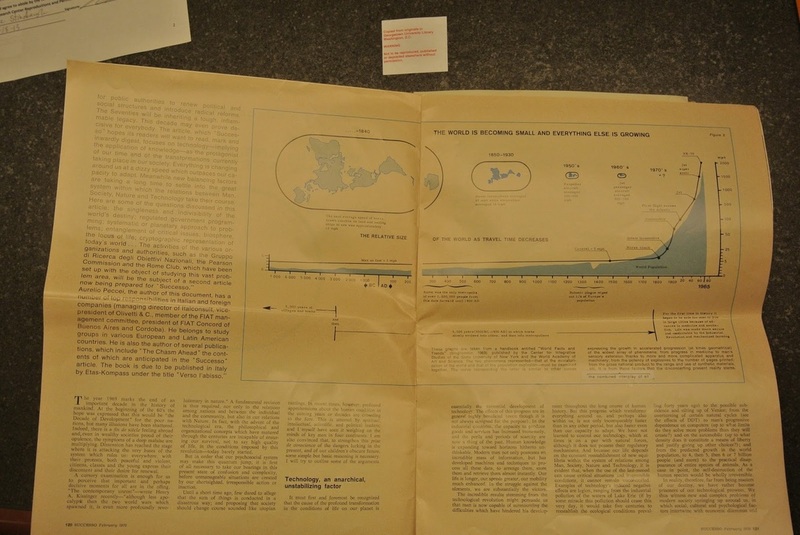 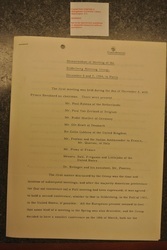 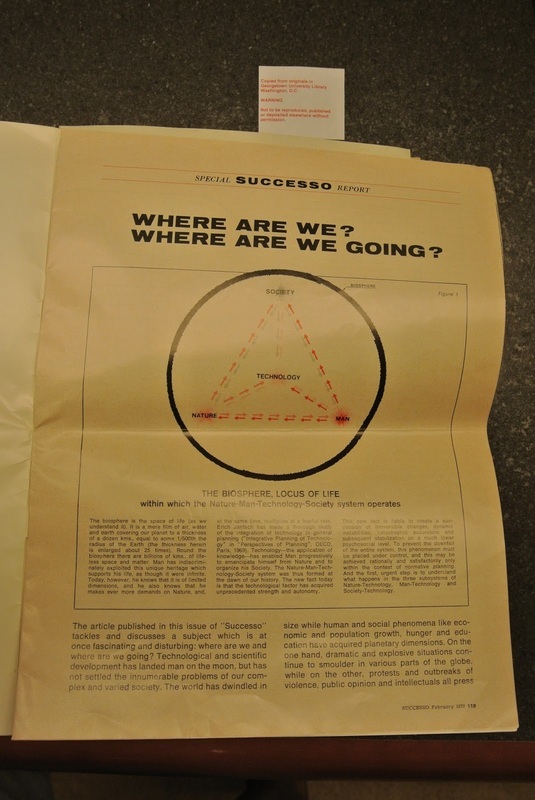 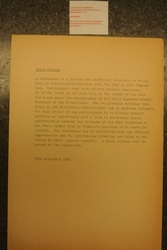 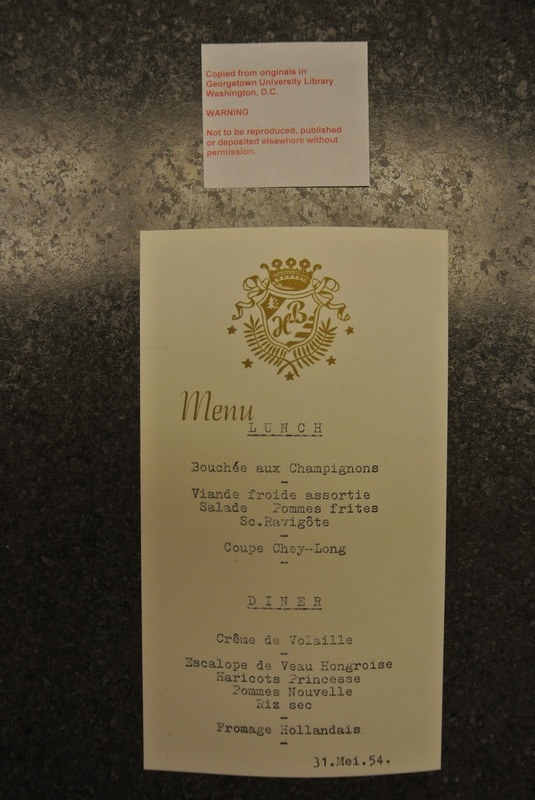 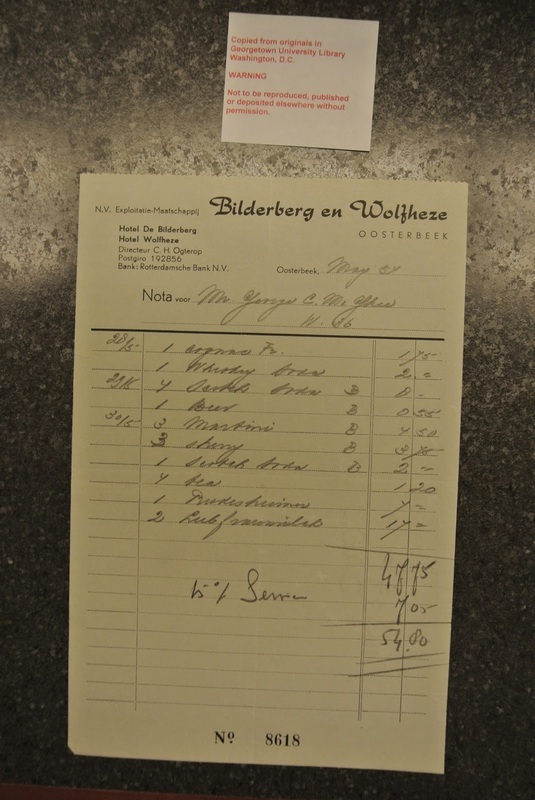 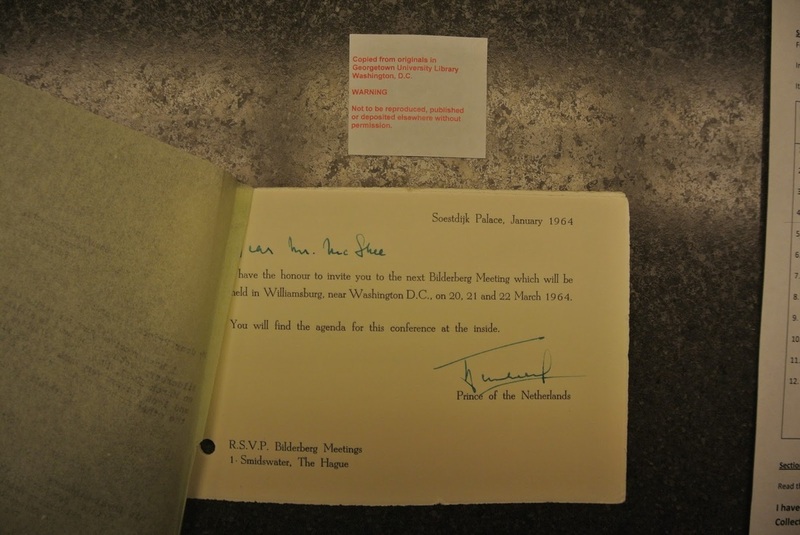 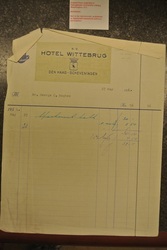 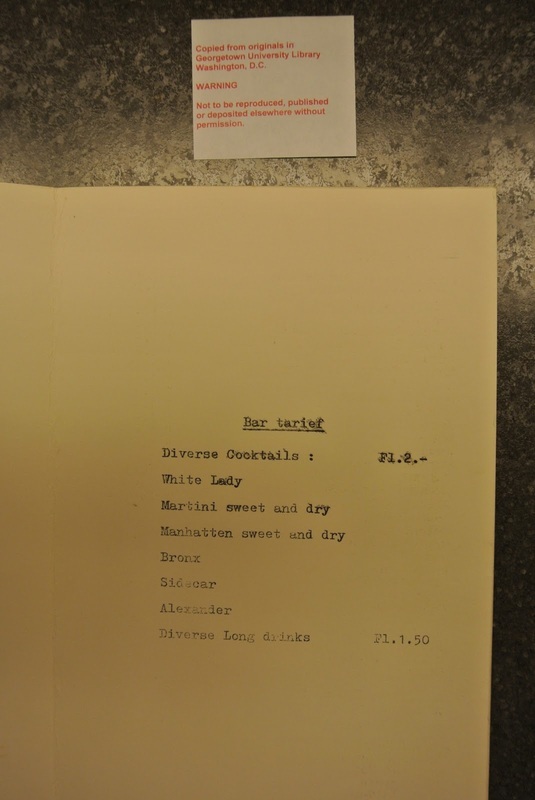 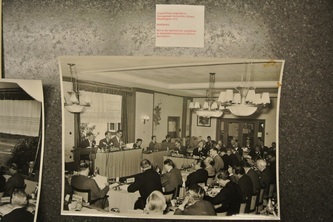 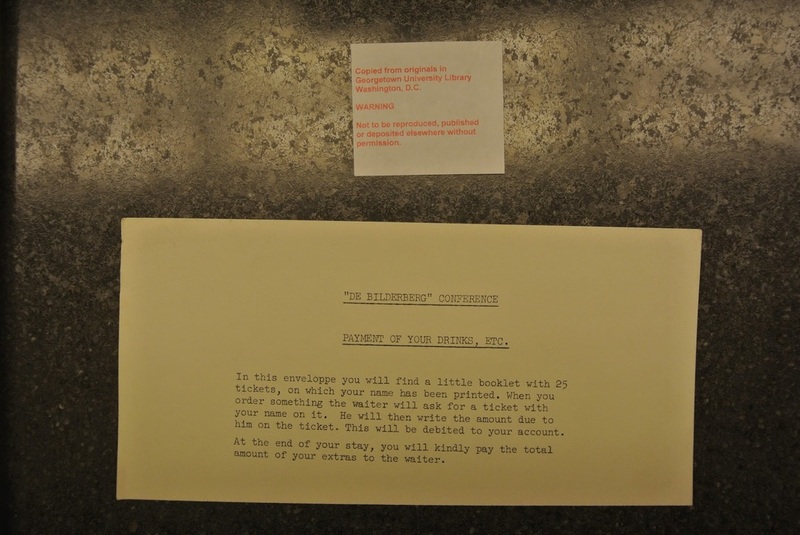 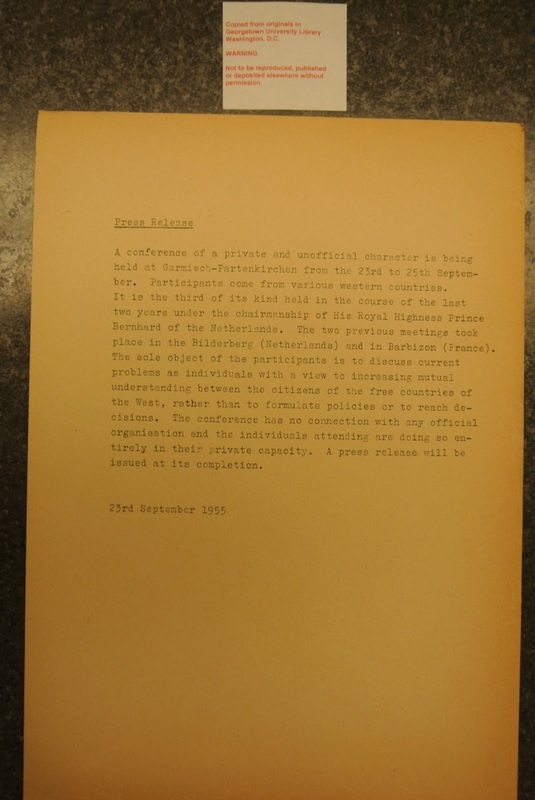 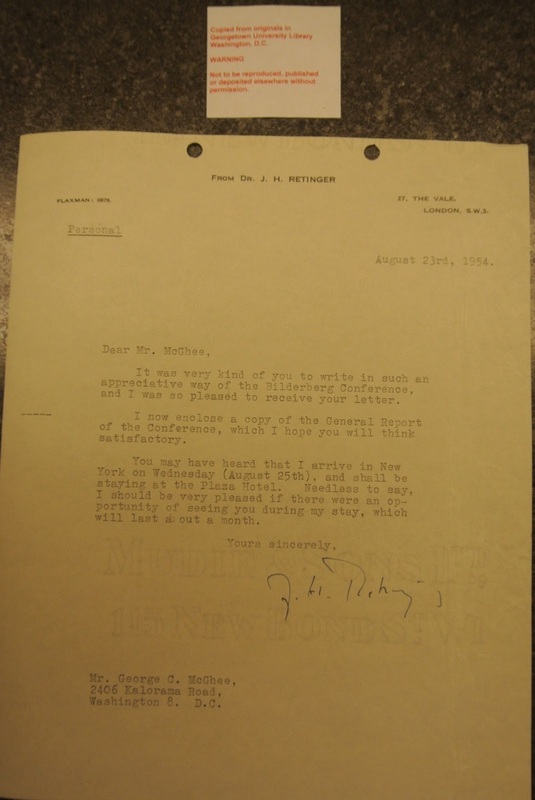 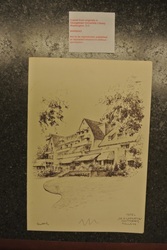 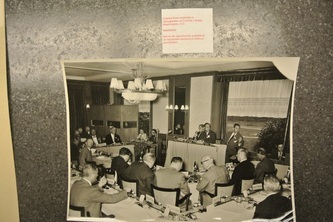 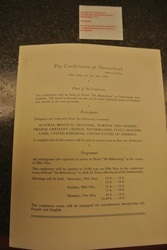 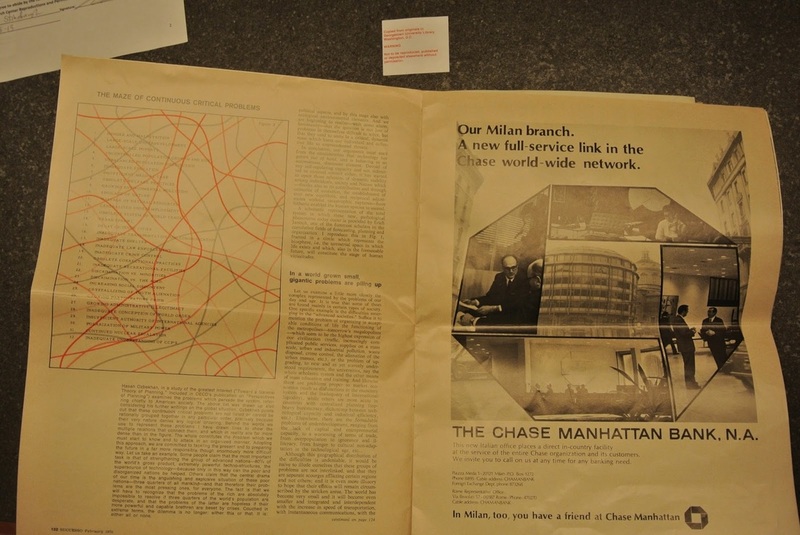 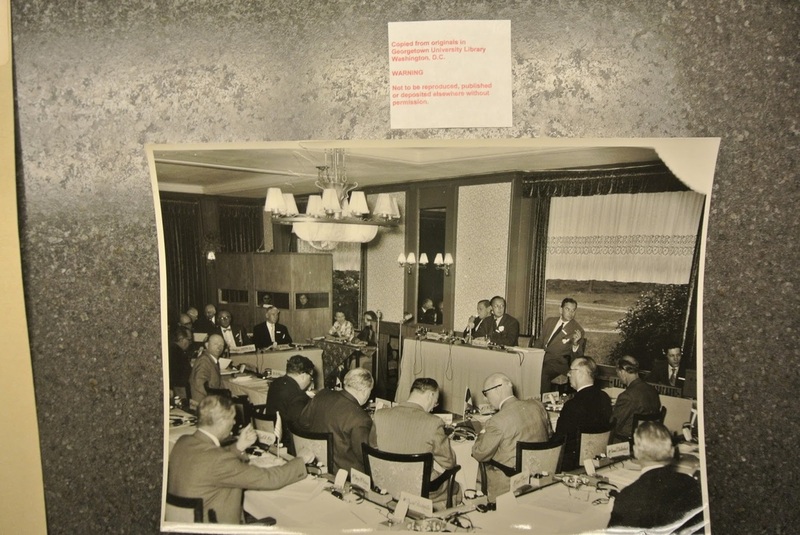 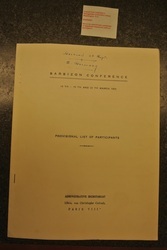 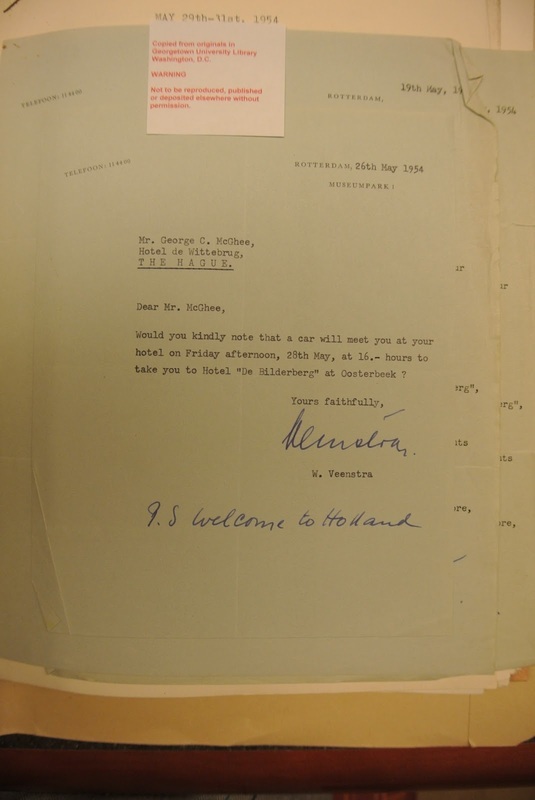 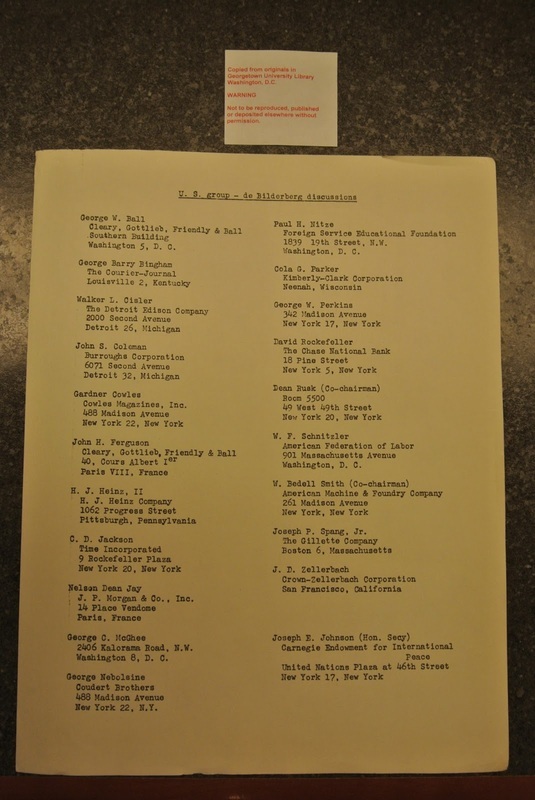 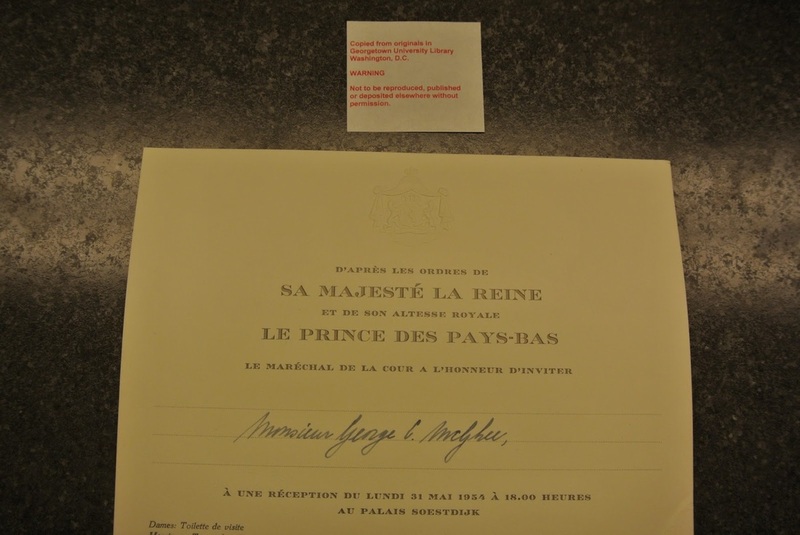 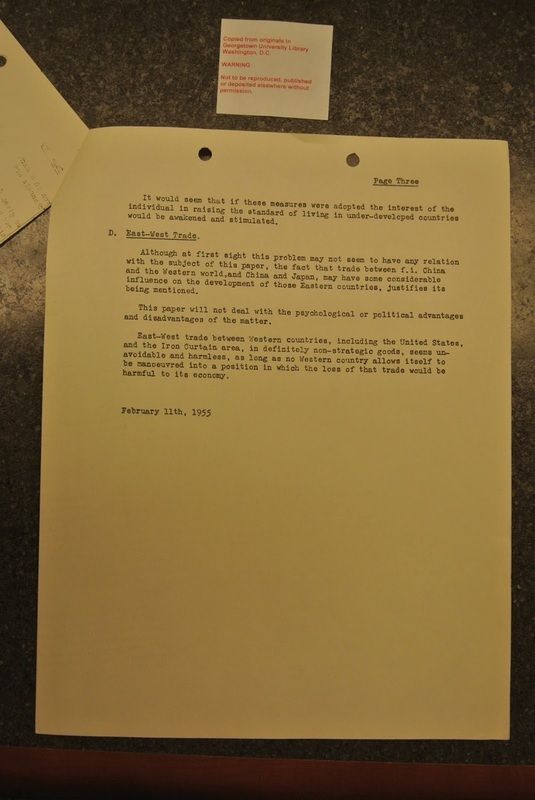 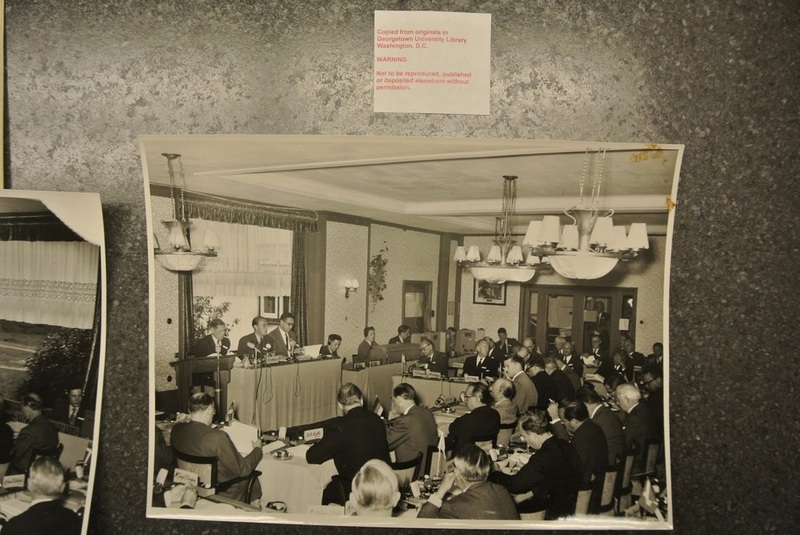 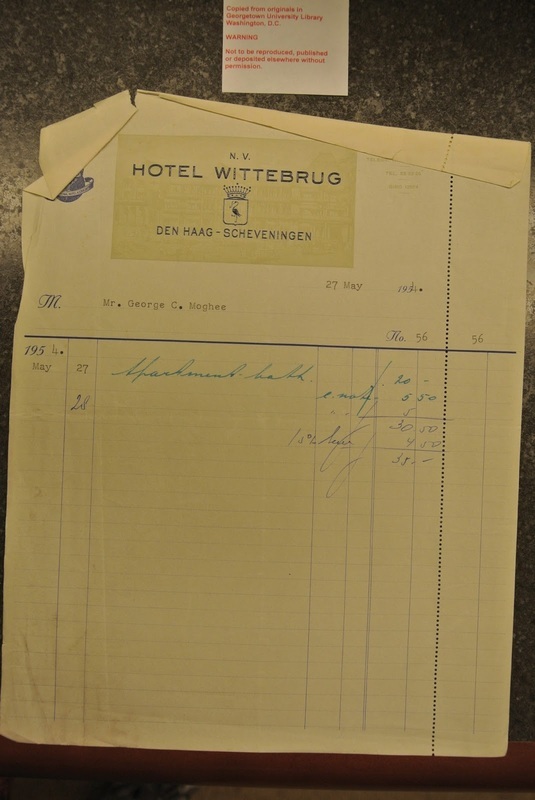 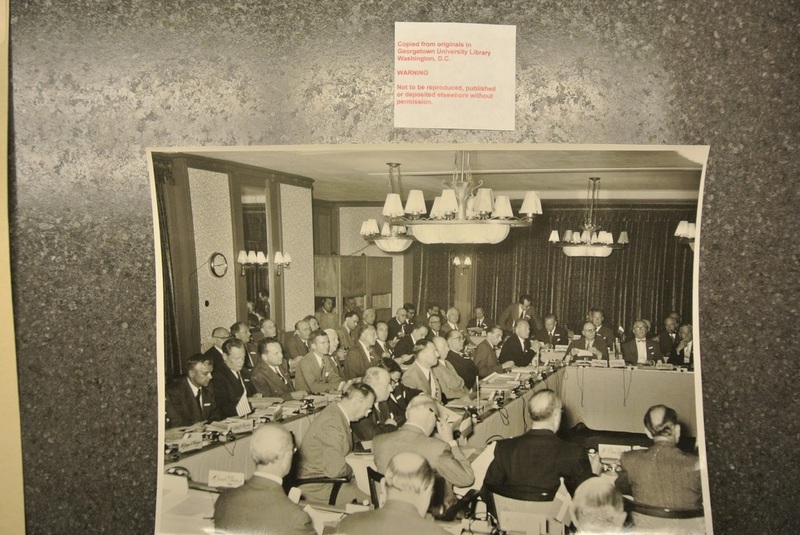 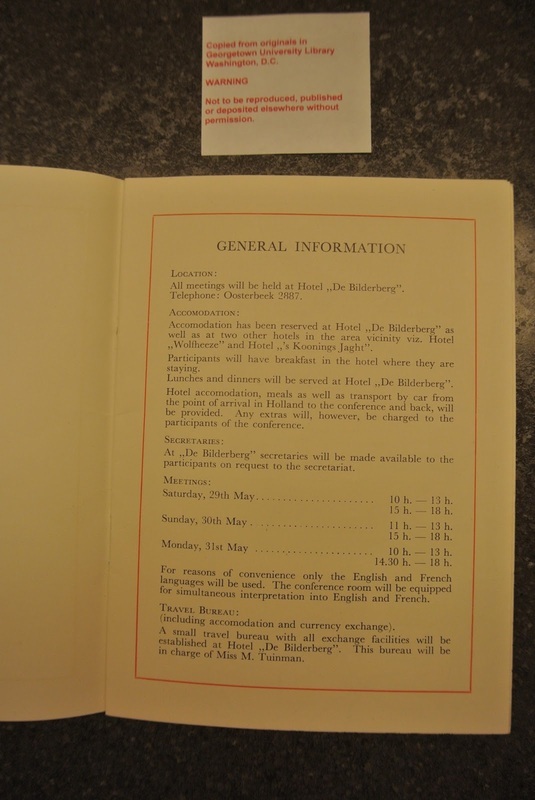 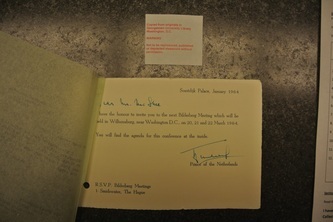 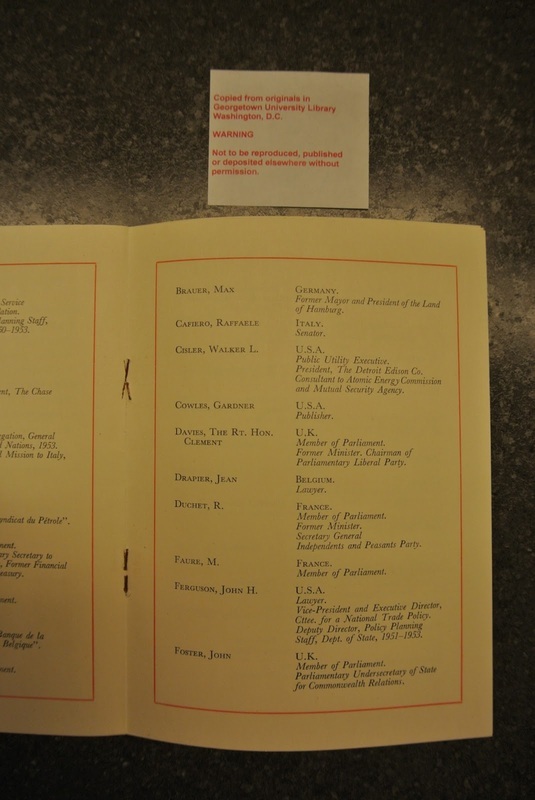 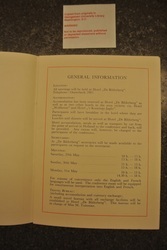 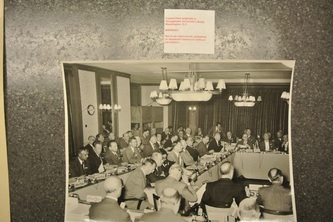 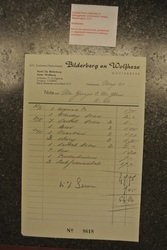 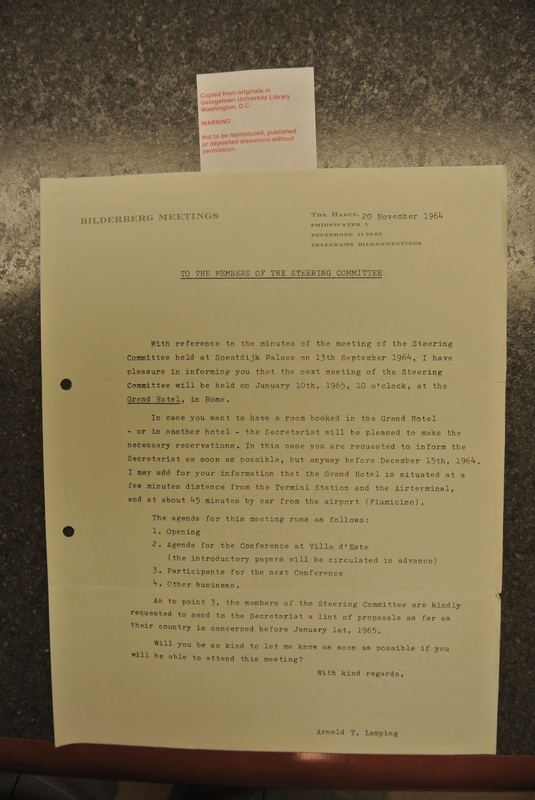 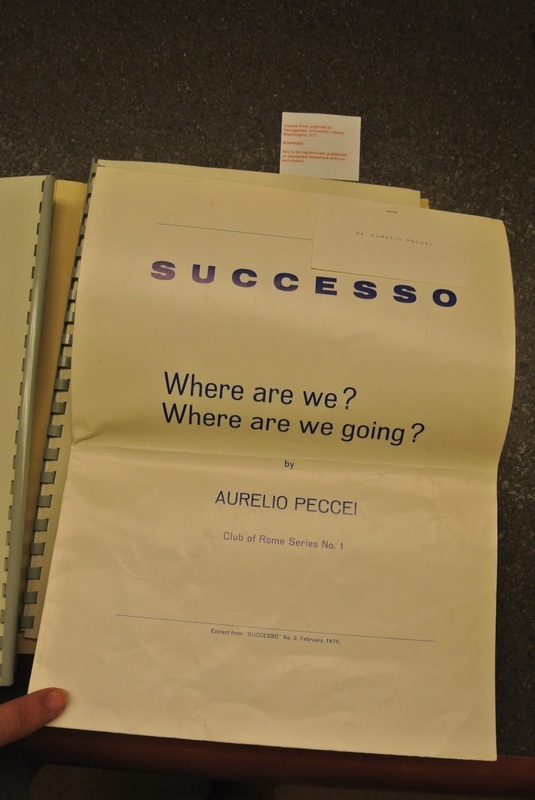 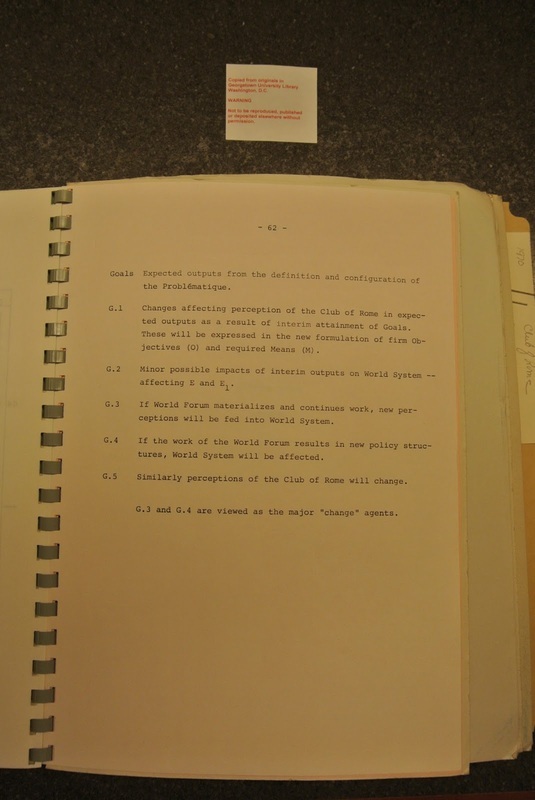 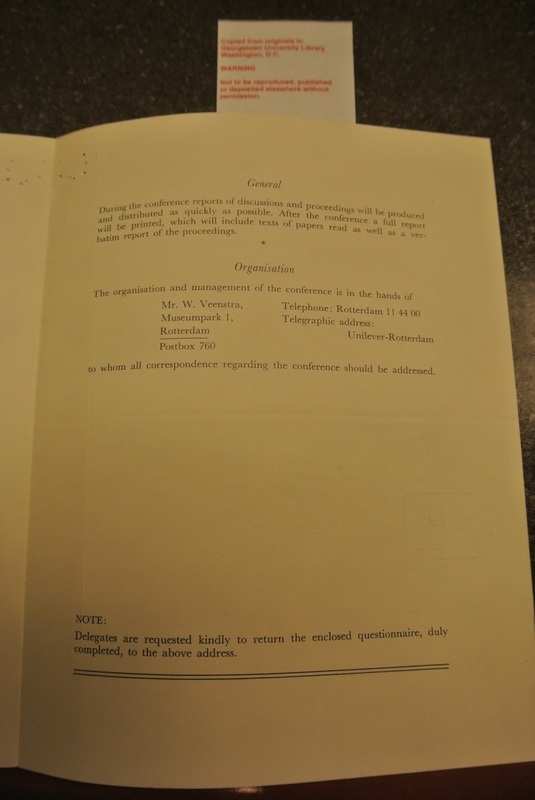 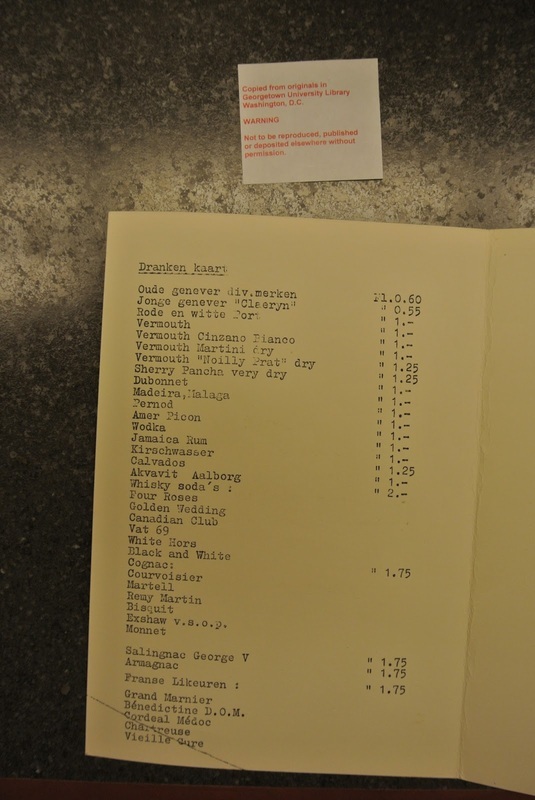 They include photographs from the first Bilderberg conference, invitations, correspondence, opinions, participants lists, bar menu’s, receipts, notes, and more. 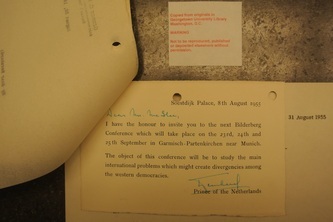 Numerous years are covered in these photographs, but thousands of pages of documents still remain un-photographed on location. 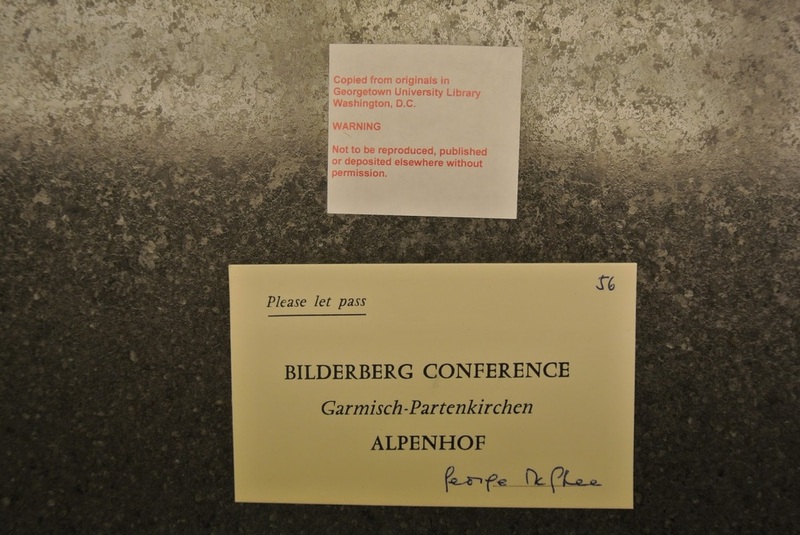 This site will act as a resource for journalists, writers and researchers interested in various topics covered in this release, as well as an outlet for the general population to view what this author is now calling, “Proof of the Bilderberg Conspiracy”. 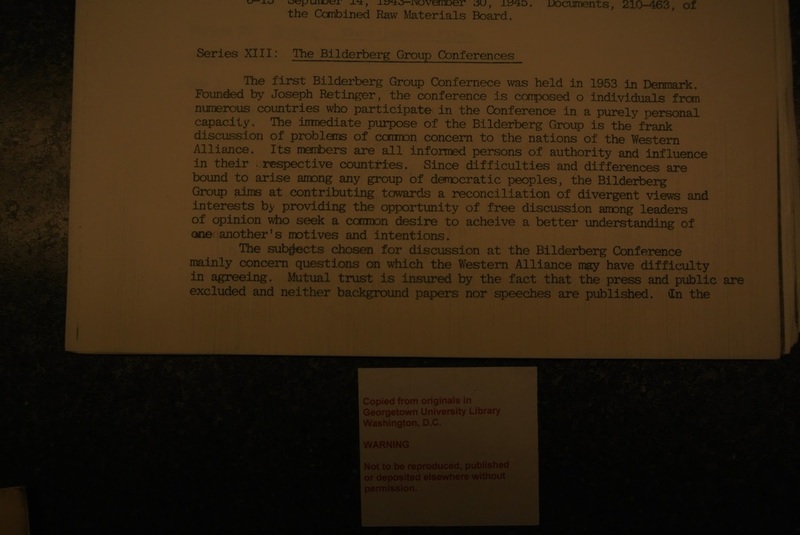 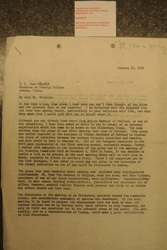 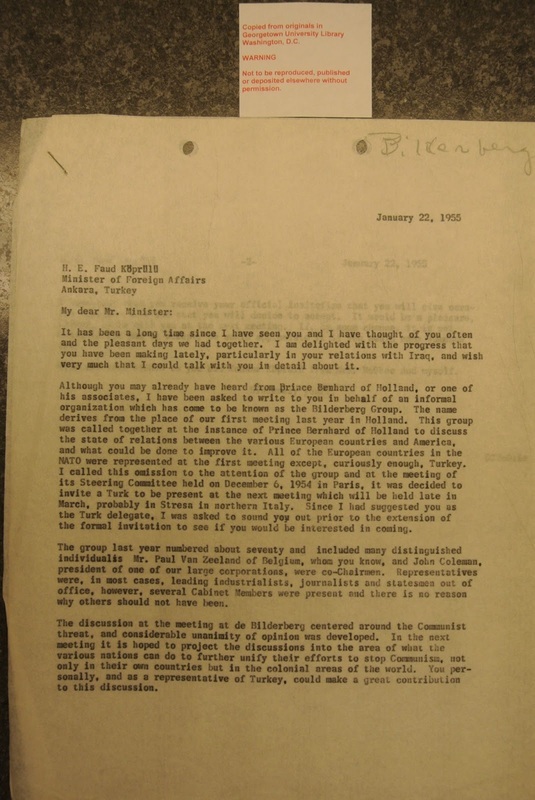 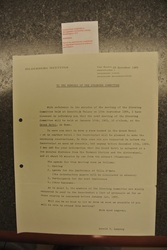 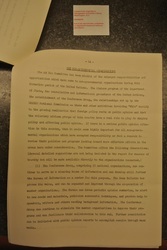 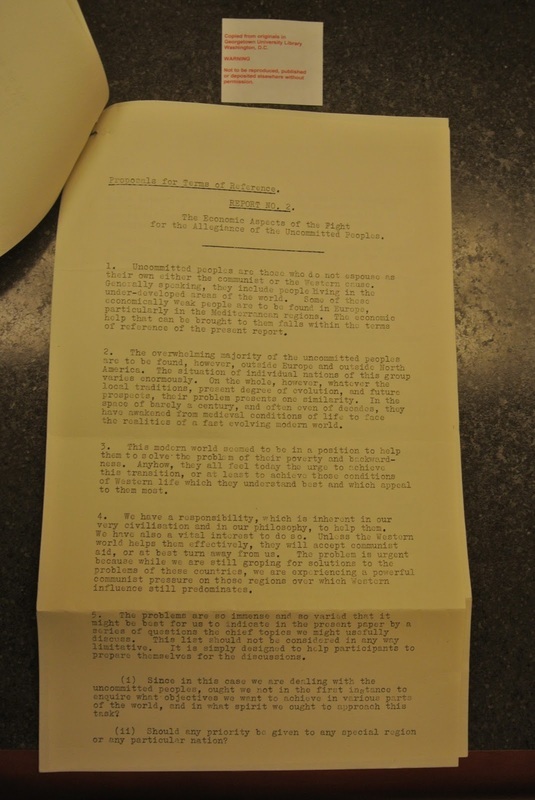 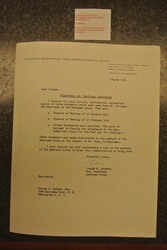 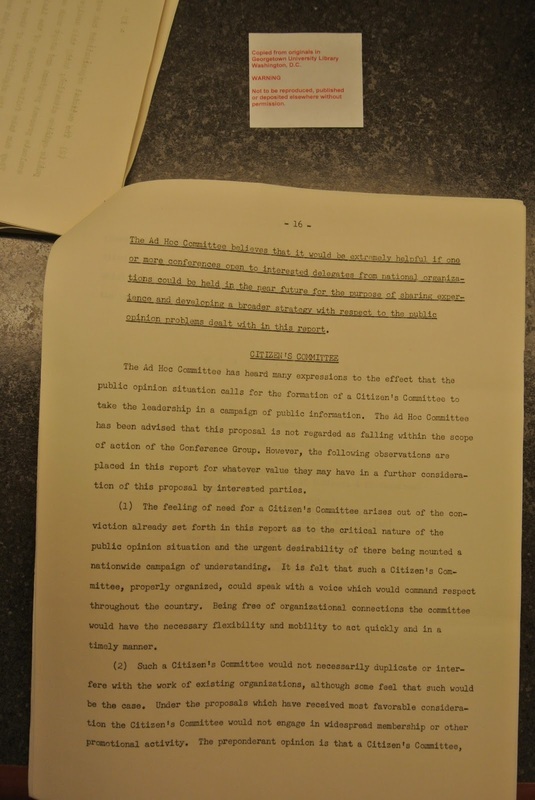 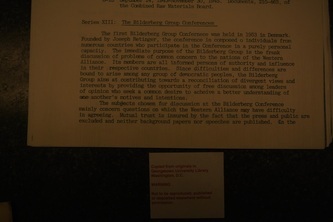 In the documents below is some of the most crucial evidence against claims of Bilderberg members that the organization is simply a place to have discussions, and that agreements are not made, policies not influenced, and opinions not brought together in order to create a global system of governance. 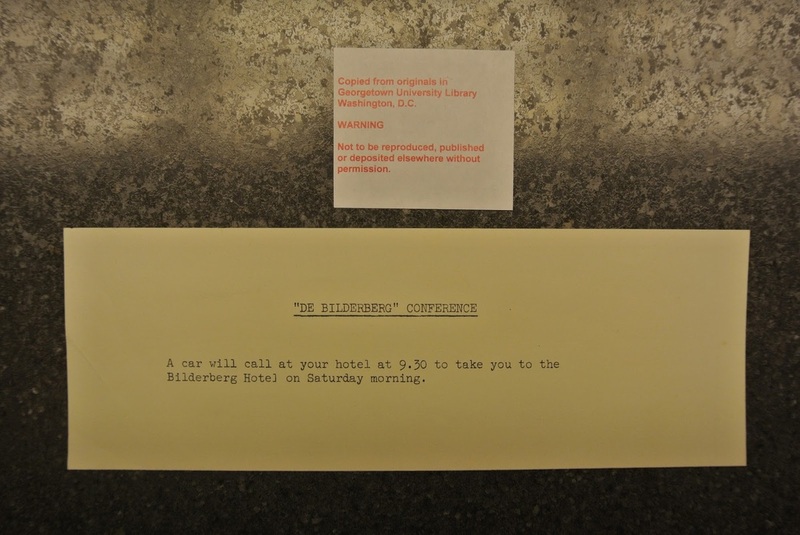 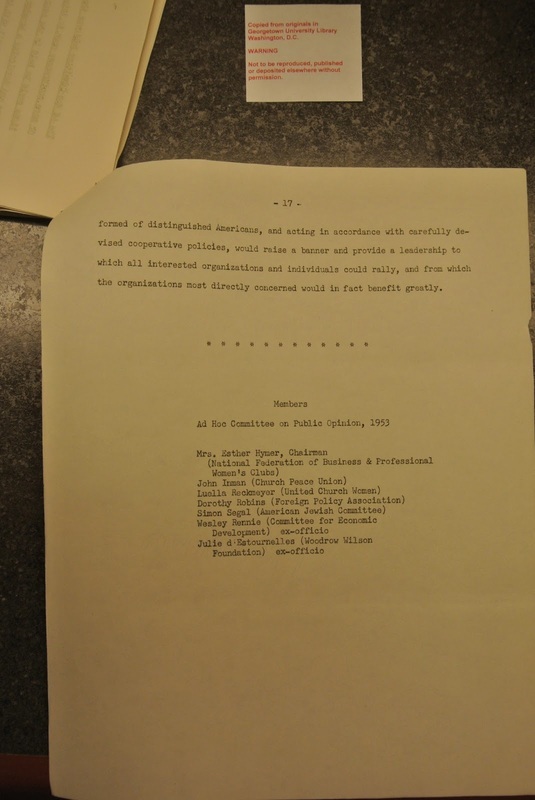 These documents prove beyond any reasonable doubt that the Steering Committee of the Bilderberg Group has been illegally planning the future of the world, without the input of the public. 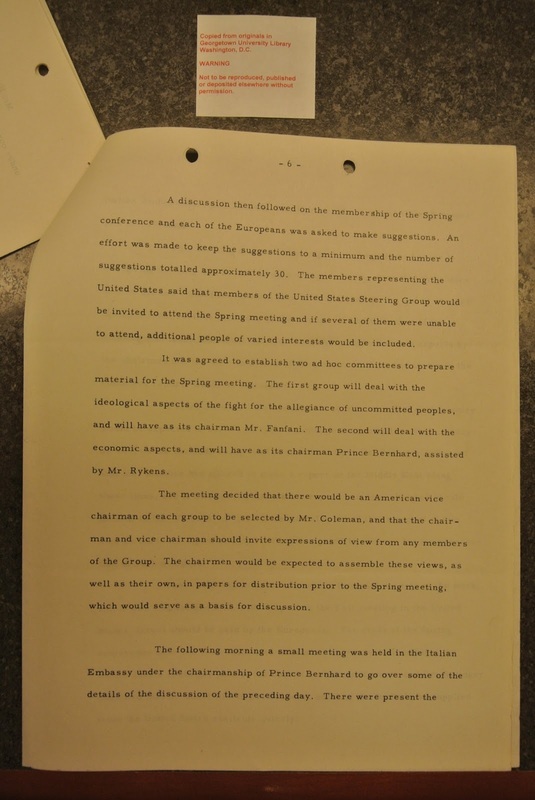 Whether their “undertaking” (In their words.) 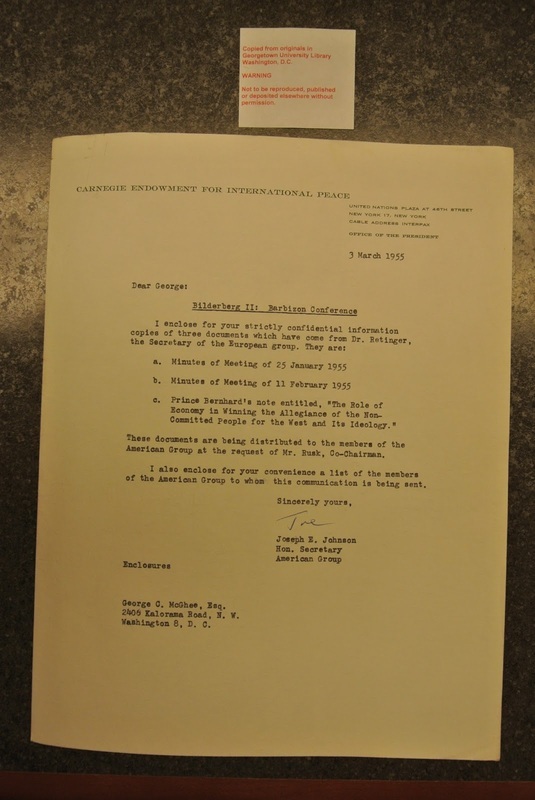 be well-intentioned or not, the group can now be proven to have been attempting to steer planetary affairs, from behind closed doors, with no serious media scrutiny, from 1954 to 2013, and beyond. This author hopes that the disclosure of these documents will help lead to an open forum, where the people of the world may bring into discussion – and hopefully the courts – the actions the Bilderberg Group has been taking in the government and private sectors, that may be found to have led to the death of millions of people over the previous decades, due to their foreign policy objectives.